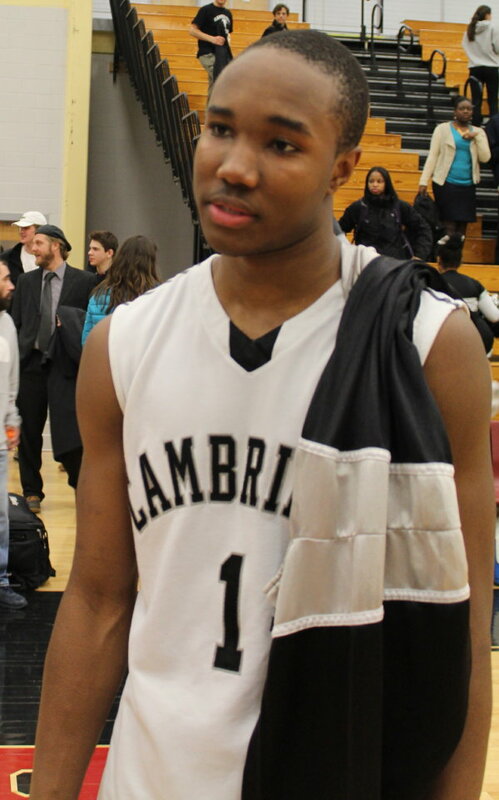 (North Andover MA) Isaiah McLeod (35 points) had a dazzling first half and set Cambridge Rindge & Latin up for a 78-62 D1 North semifinal win over Andover on Wednesday night at North Andover High School. 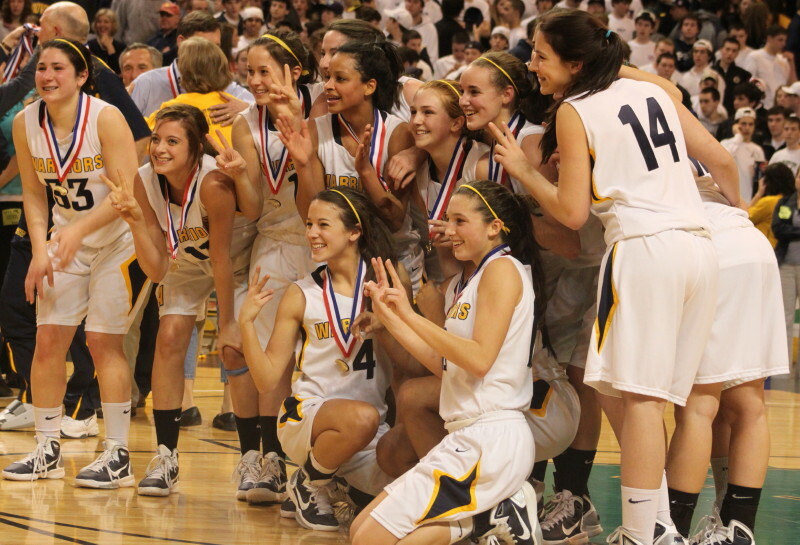 The Falcons (20-2) now meet St. John’s Prep at the Tsongas Center on Saturday (7:45PM) for the D1 North title. 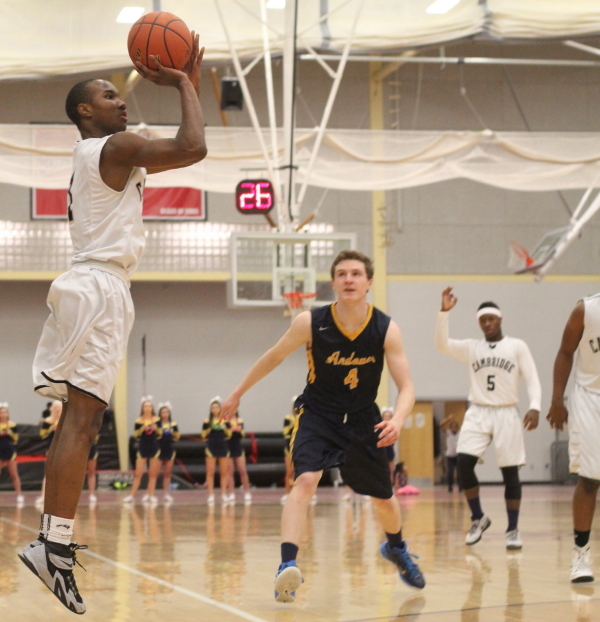 Senior Isaiah McLeod had a first half (25 points) in which shots from everywhere were dropping. Layups, jump shots, 3-pointers, and foul shots, you name it, he hurt the Warriors from them all. The Falcons never trailed. The Warriors (17-6) were only down 8-6 after an EJ Perry old-fashioned 3-point play after less than two minutes. 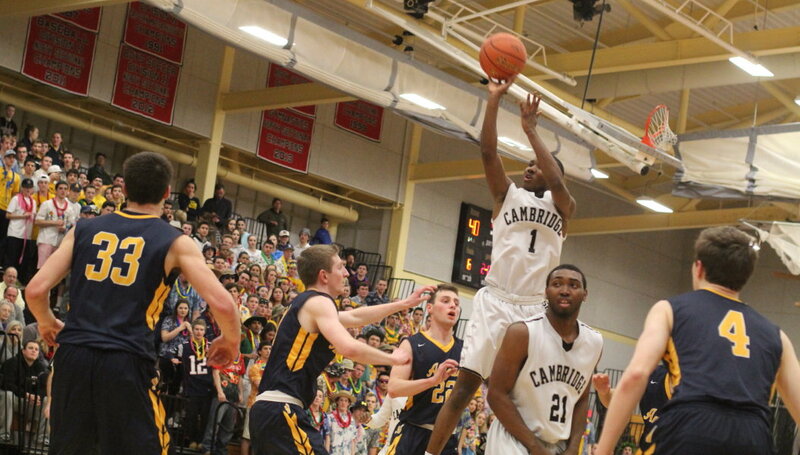 Isaiah, however, took over the next 2 ½ minutes as Cambridge ran thirteen unanswered points. 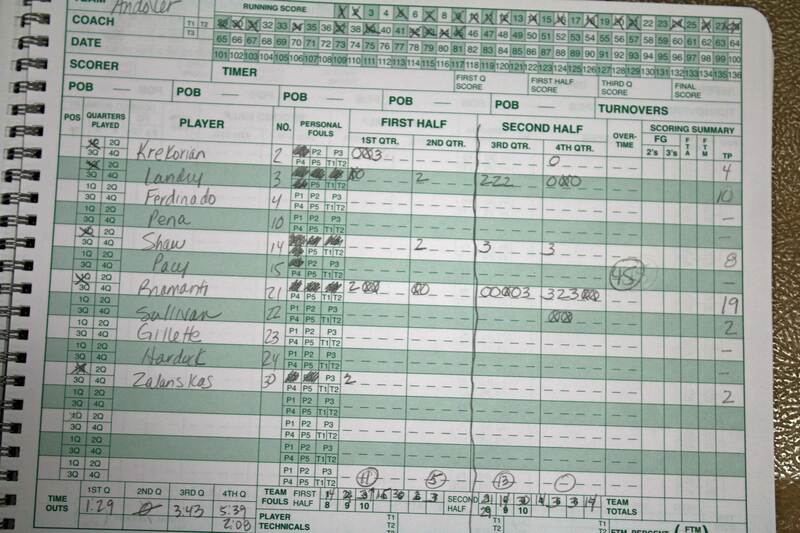 Isaiah had ten of them including two 3’s. 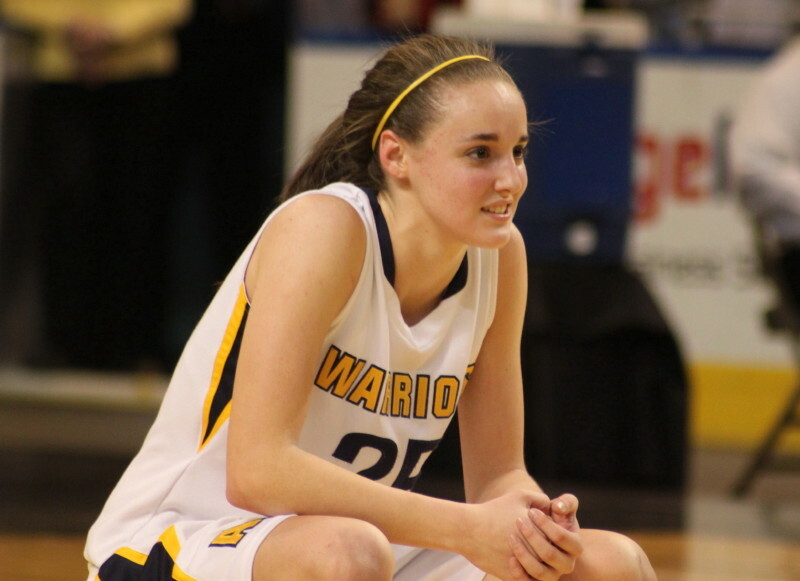 Now down fifteen (21-6) the Warriors unsuccessfully played catch-up the rest of the way. 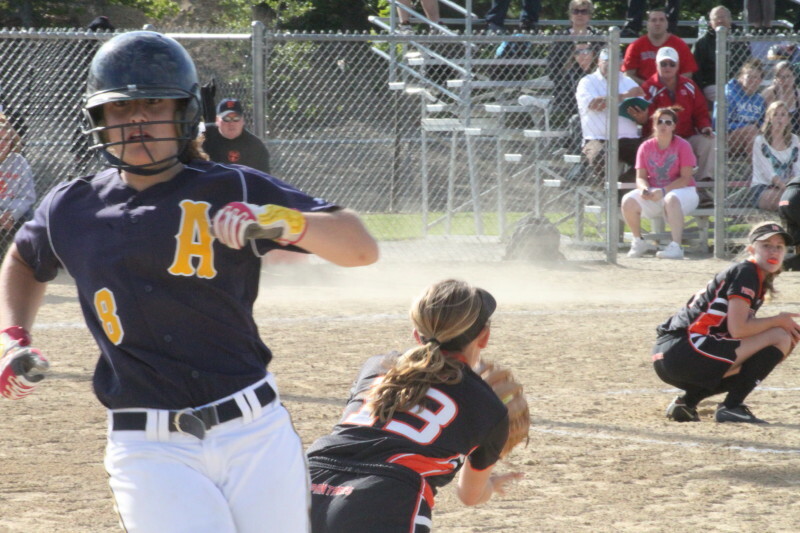 Andover was down but the out part took a little more doing for the Falcons. 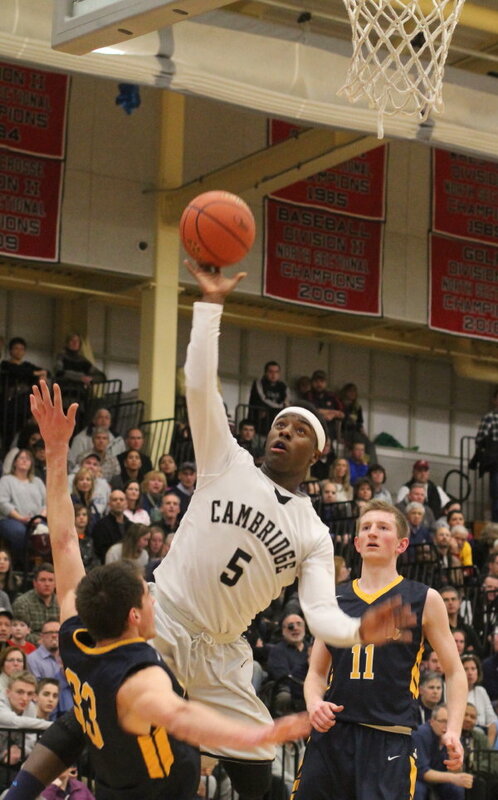 Cambridge was up by twenty (40-20) with less than two minutes left in the second half but three’s by David Giribaldi and Jonathan Rodriguez plus a Connor Merinder layup narrowed the Andover deficit to twelve (40-28) at halftime. 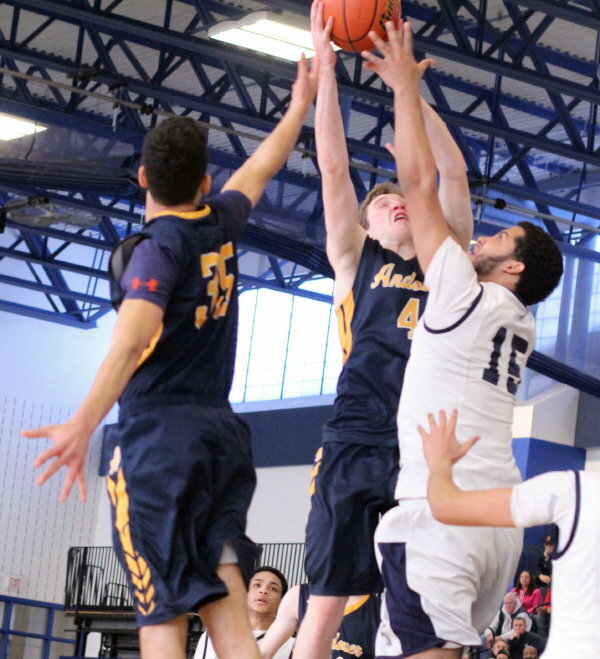 Seniors David Garibaldi (19 points) and Connor Merinder (22 points) caught fire together in the third quarter and suddenly Andover was within six (44-38) with 2+ minutes left in the quarter. But that Andover momentum came to a stop as Demitrius Woodson (just off the bench) drained a three from the right corner on an inbounds play. 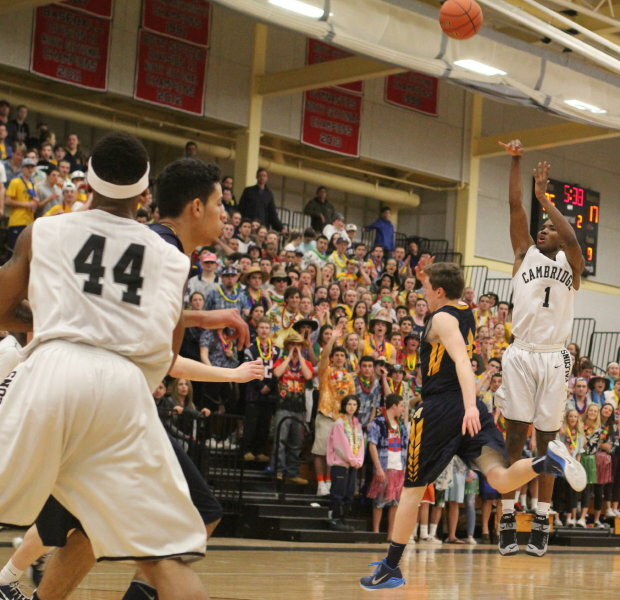 On Cambridge’s next possession Tevin Charles duplicated the three-spot from the other corner. 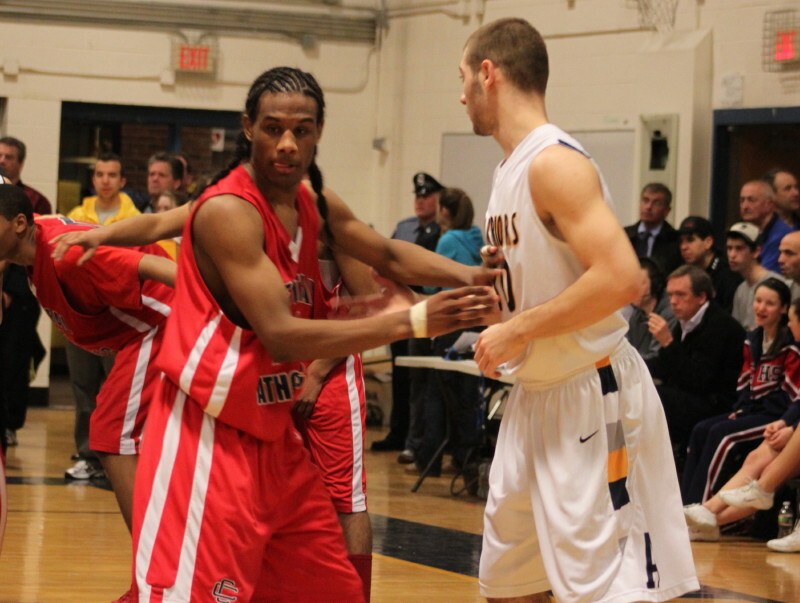 Tevin had all fifteen of his points in the second half. 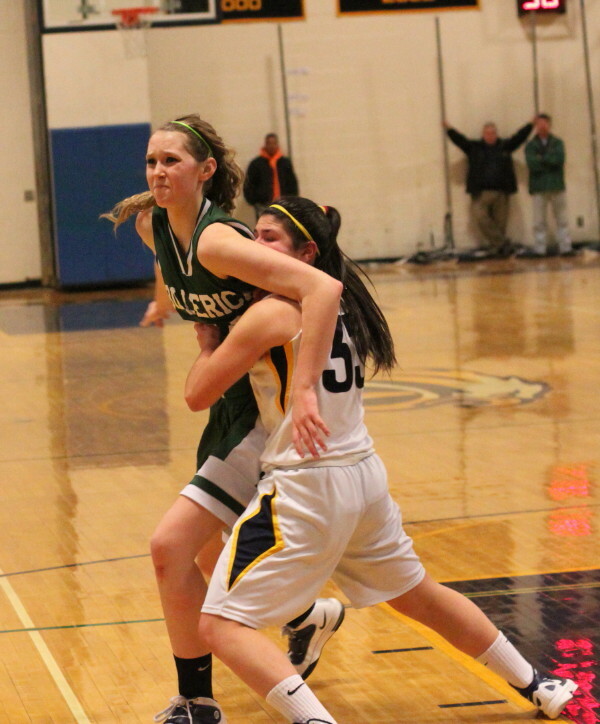 Back down by twelve went Andover. 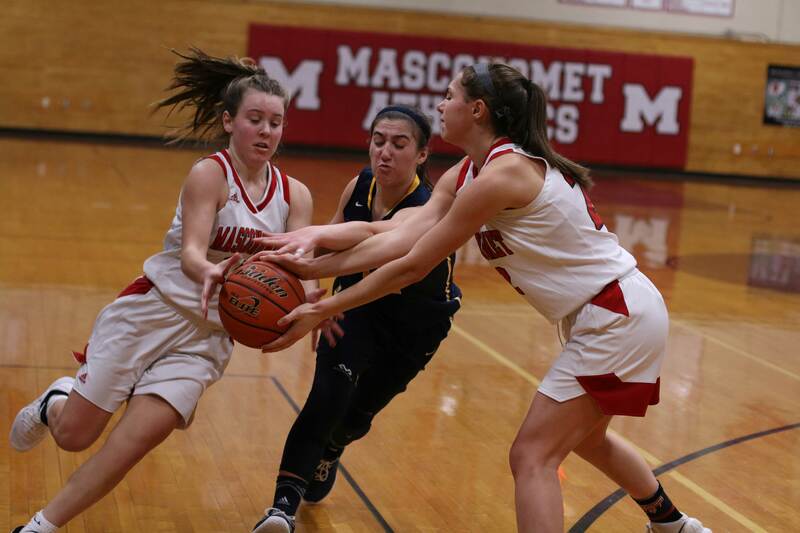 The Warriors would get within eight a couple of times early in the final quarter but the combo of fatigue and persistent Cambridge offense never let them get closer. 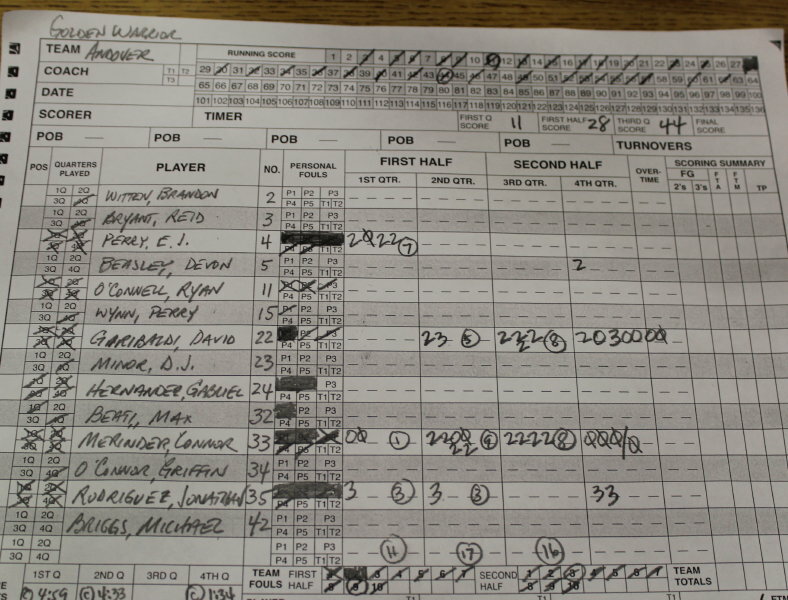 The nail in the coffin was at 2 ½ minute mark when Andover senior inside presence Connor Merinder fouled out. 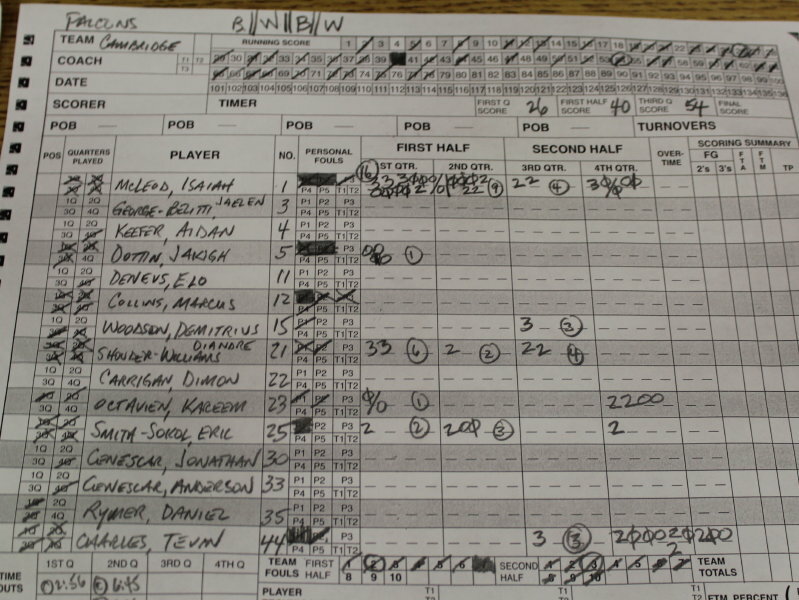 The Falcons ended up with eight 3-pointers including five in the breakaway first quarter. 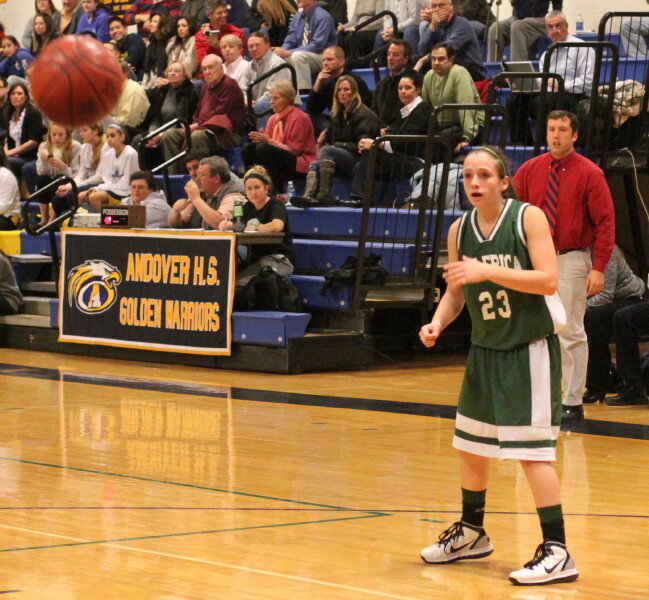 I don’t know how many three’s Andover took but there were plenty of them. Their long-range insistence turned costly in the first half as their inaccuracy allowed Cambridge to build up a big lead. 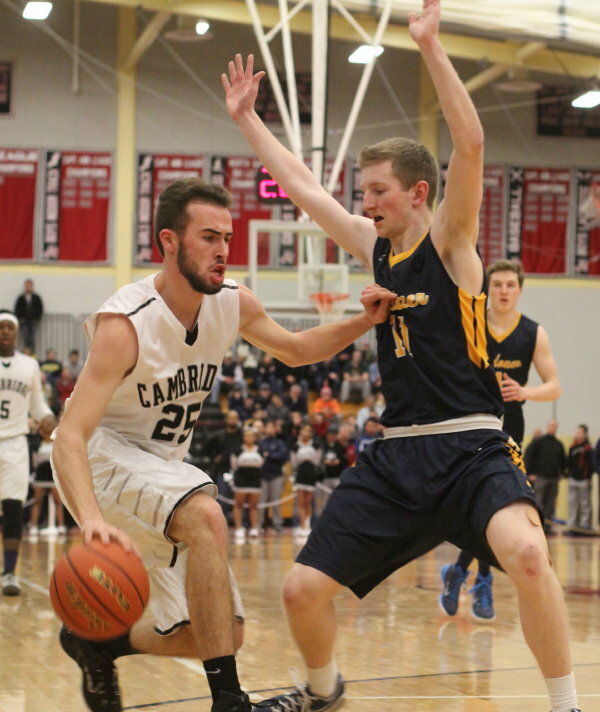 Connor Merinder showed a nice baby hook inside that Cambridge struggled to defend. Isaiah McLeod is committed to Southern Connecticut State in New Haven. When a good player like Isaiah has it going from anywhere he chooses there isn’t a defense that can stop him. 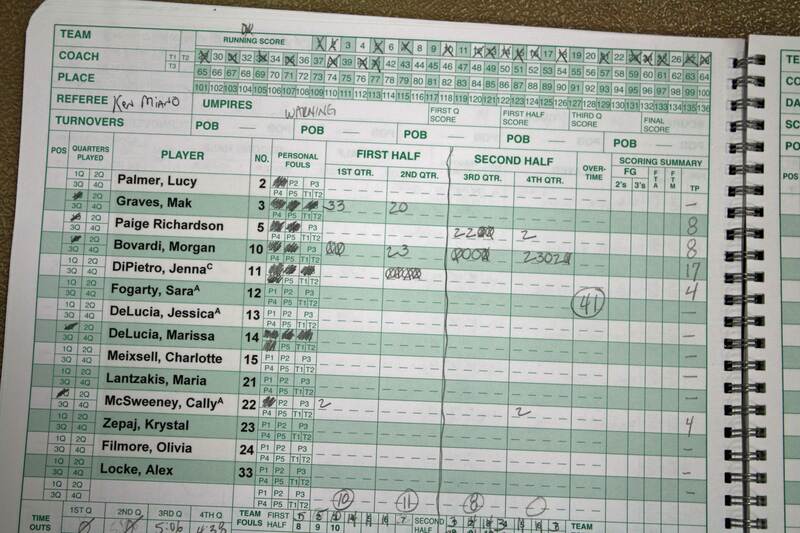 Andover ran a bunch of players at him but nothing worked in the first half. St. John’s better have something prepared for #1 or they’ll be in serious trouble at the Tsongas Center on Saturday. 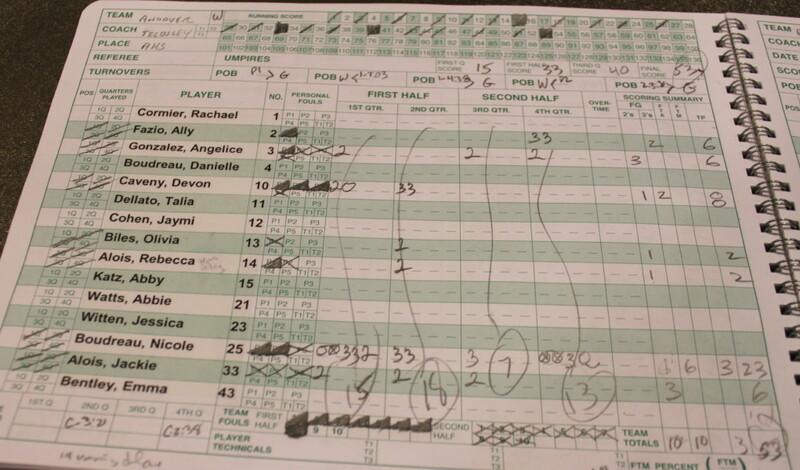 Cambridge coach Lance Dottin won his 300th game in December. 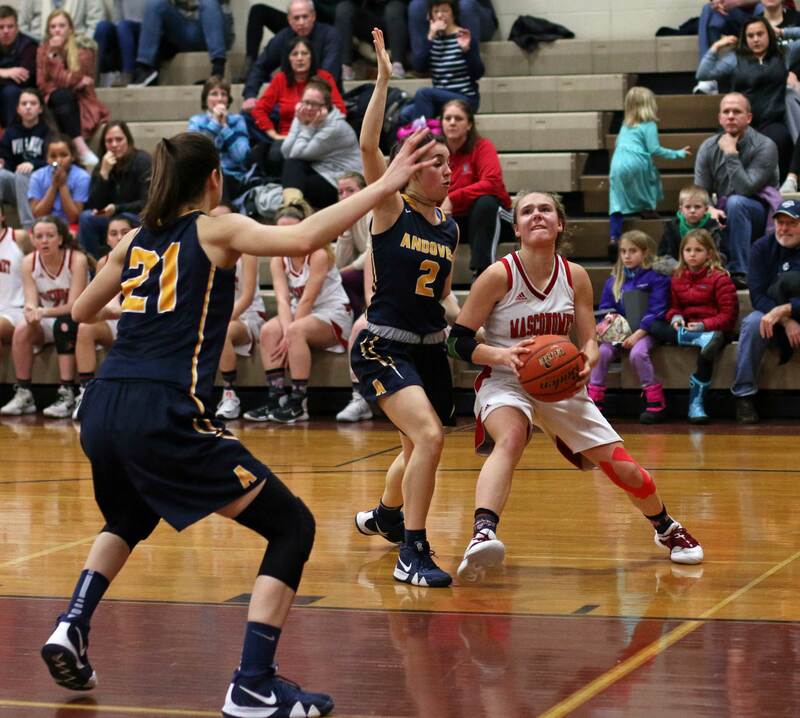 The Falcons two losses have been to out-of-state teams – Albany Academy and Archbishop Molloy. Cambridge is in the Dual County (Large) League. 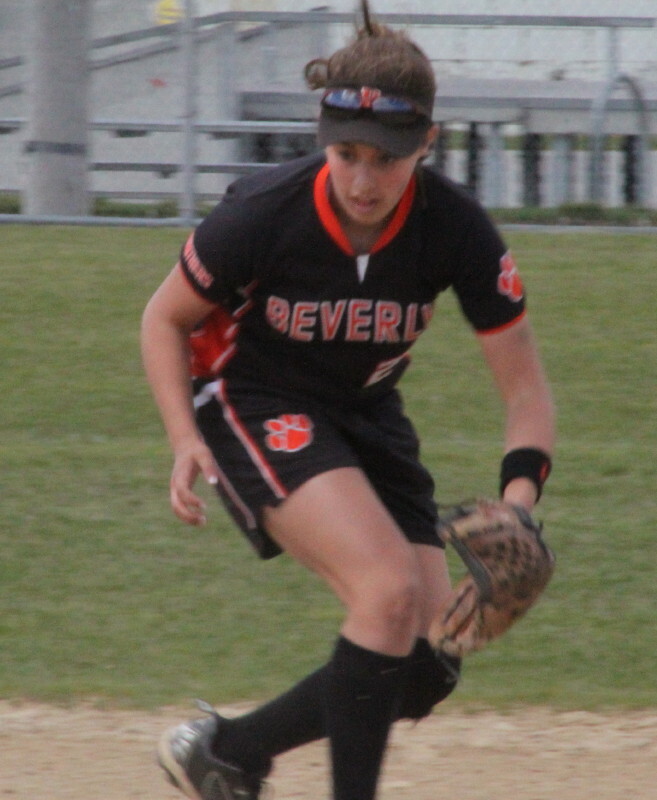 Andover hails from the Merrimack Valley Conference. 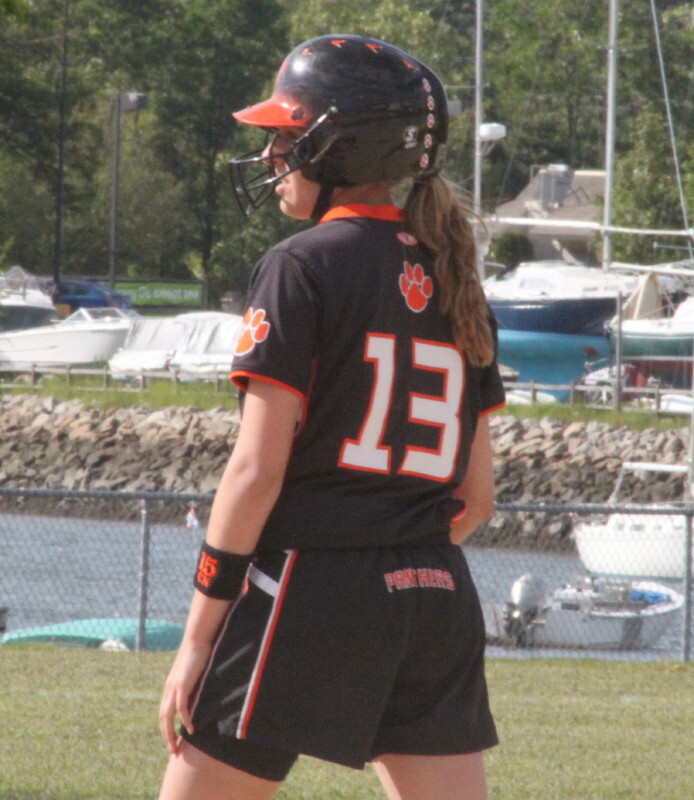 Where does the “Rindge” part of Cambridge Rindge and Latin come from? Generous Frederich Hastings Rindge was connected to the school in the late 1800’s. No sign of Cambridge alum Mayor Bill DeBlasio of NYC at the game. (Lawrence MA) What a game! 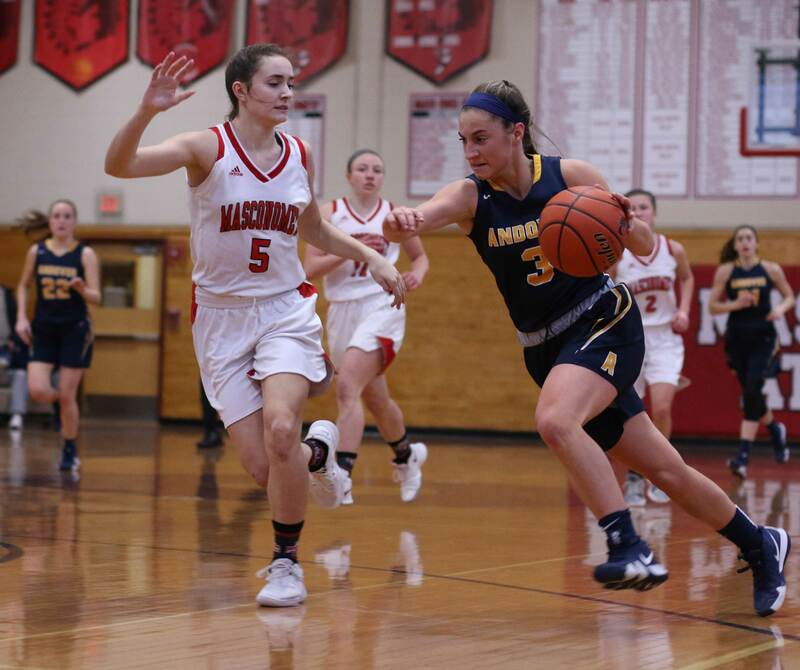 #4 Andover ends up the winner, 86-79, in double overtime over #5 Lawrence on Saturday afternoon in the Division 1 North quarterfinals. Don’t let that final score fool you. 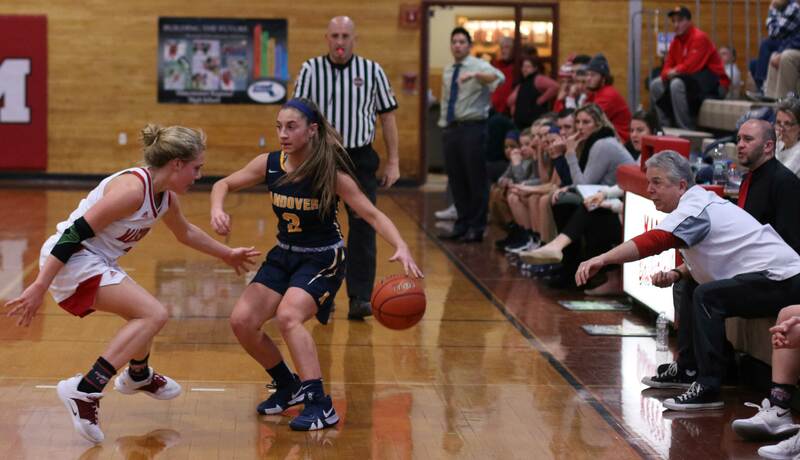 Once Lawrence rallied all the way back from a fourteen point deficit (48-34) late in the third quarter this one entered the anyone’s game realm. 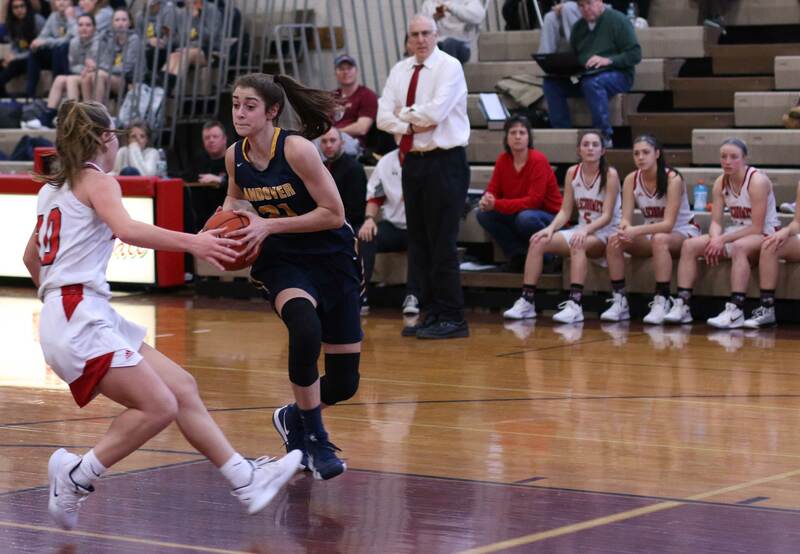 There were big shots all over the place and some of them potential game winners. 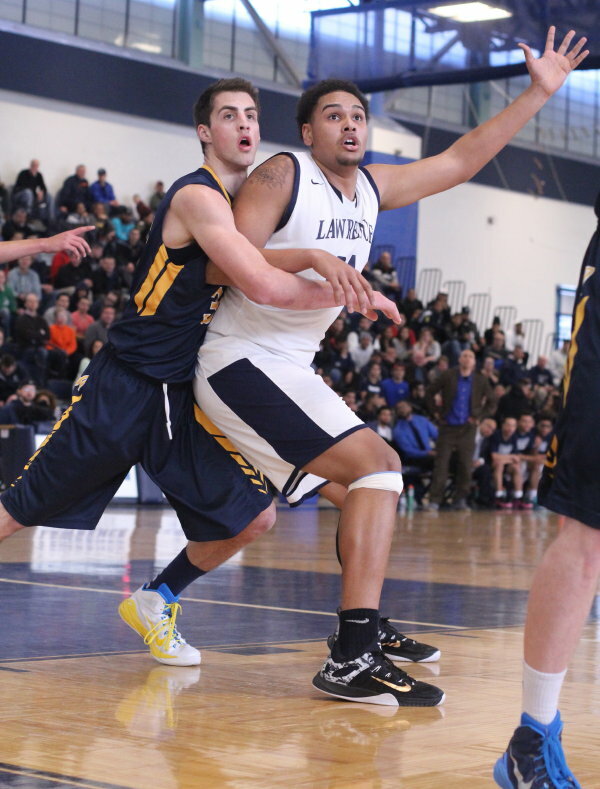 Julio Vicente (20 points) of Lawrence had the last shot in regulation and missed. 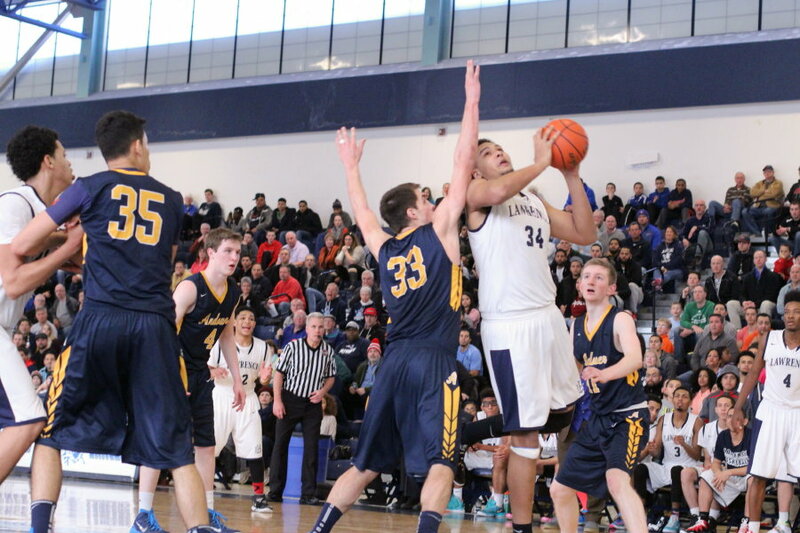 David Garibaldi (12 points) had the same opportunity for Andover at the end of the first overtime but also missed. 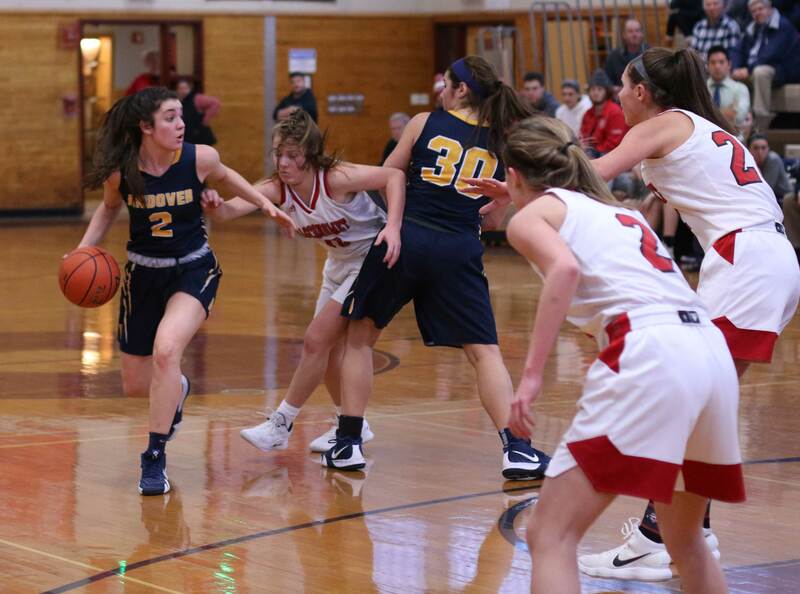 The big shot from the floor turned up regularly but in the decisive second OT it was the shooting from the line by Andover that made the difference. After Franziel Reyes (10 points) tied the score at 74-74 with 2:18 left, the Warriors shot nothing but free throws (fourteen) the rest of the way and clutched twelve of them. Lawrence during the same stretch was 2-for-7 from the foul line missing the front end of two one-and-one’s (Julio Vicente & Dantae Neal) as well as several 3-point attempts to seal their fate. 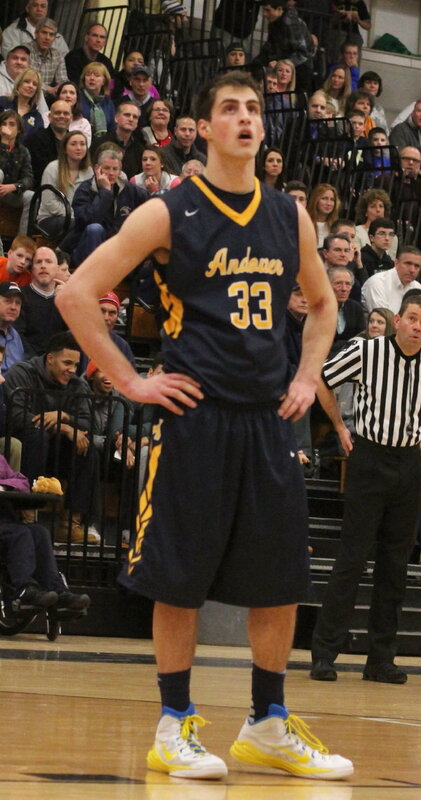 Senior Connor Merinder (29 points) had a huge game for Andover. 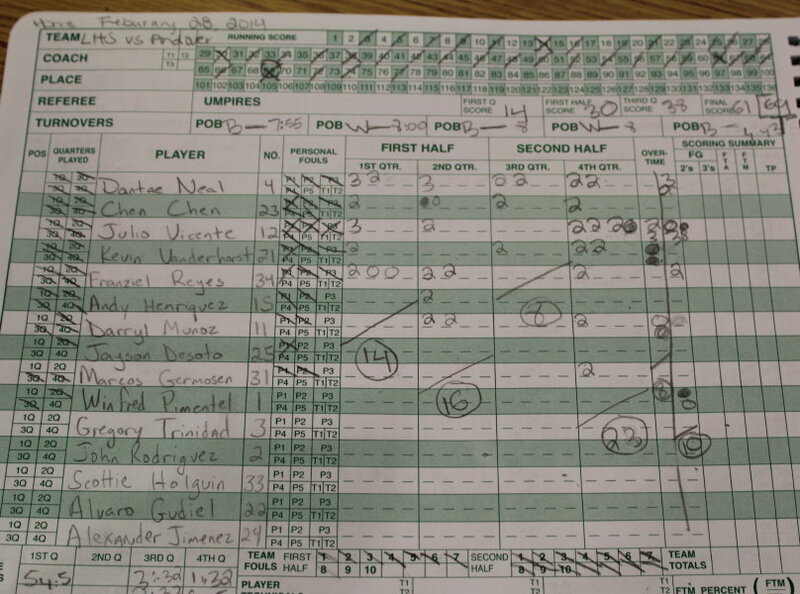 Connor at 6-5 held his own on the inside against 6-9 Franziel Reyes and stayed out of foul trouble. 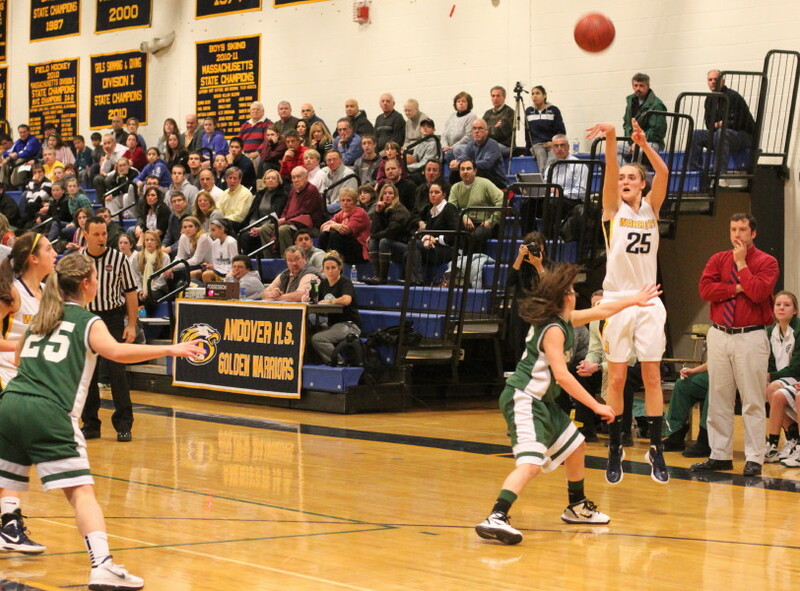 Connor also hit the last successful shot in regulation with thirteen seconds left that enabled Andover to reach overtime. 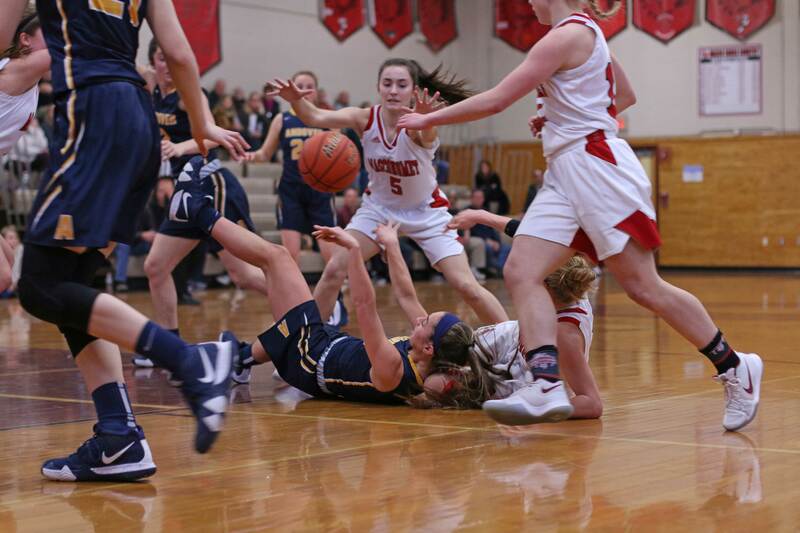 Fouls were an issue for Lawrence. 5-8 point guard Julio Vicente missed playing time after getting his 3rd foul with two minutes left in the first half and then adding his 4th with two minutes left in the third quarter. Eventually, LHS coach Raymond Nunez was forced to play Julio 4 fouls or not late in the game and it paid off. 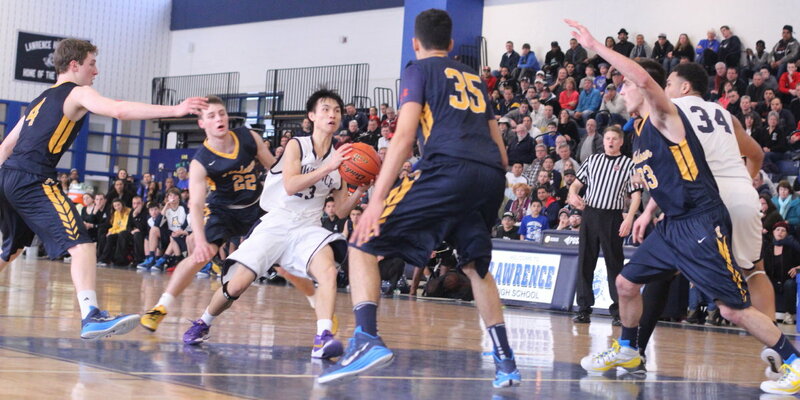 The Lancers lost speedy guard Chen Chen on fouls with 1 ½ minutes left in regulation. Lawrence led early (9-4) but the visitors put a 12-2 run together (three hoops by Connor Merinder) to lead 16-11 late in the first quarter. 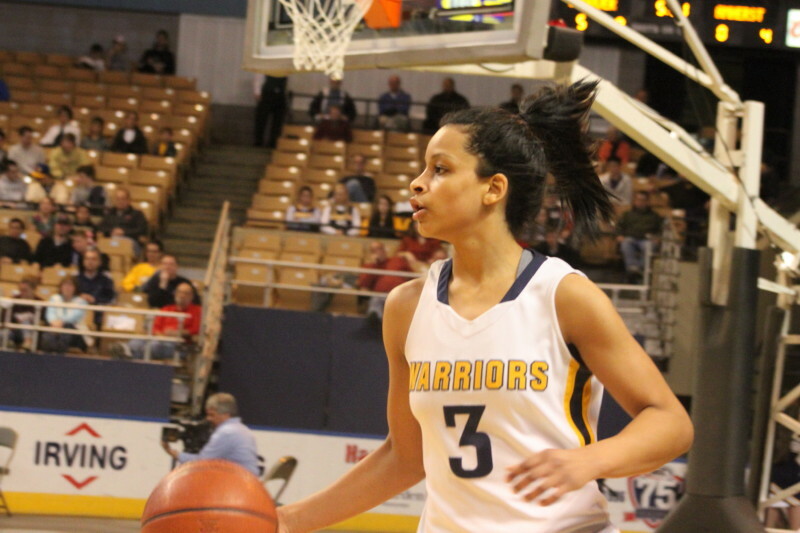 In the second quarter the Warriors put an 11-3 segment together highlighted by sophomore EJ Perry’s (22 points) 3-pointer to gain an 35-26 advantage with 1 ½ minutes until halftime. 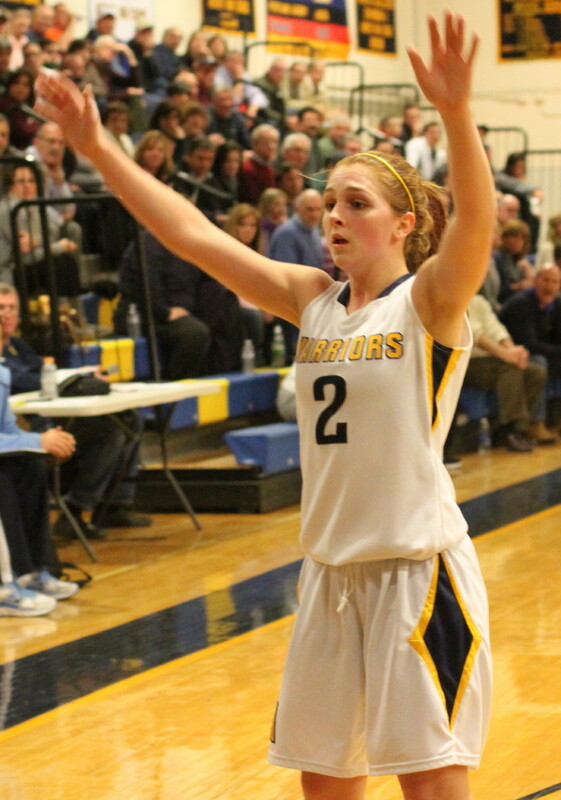 The Warriors’ lead would extend to 48-34 before the Lancers put a serious rally together in the final quarter. 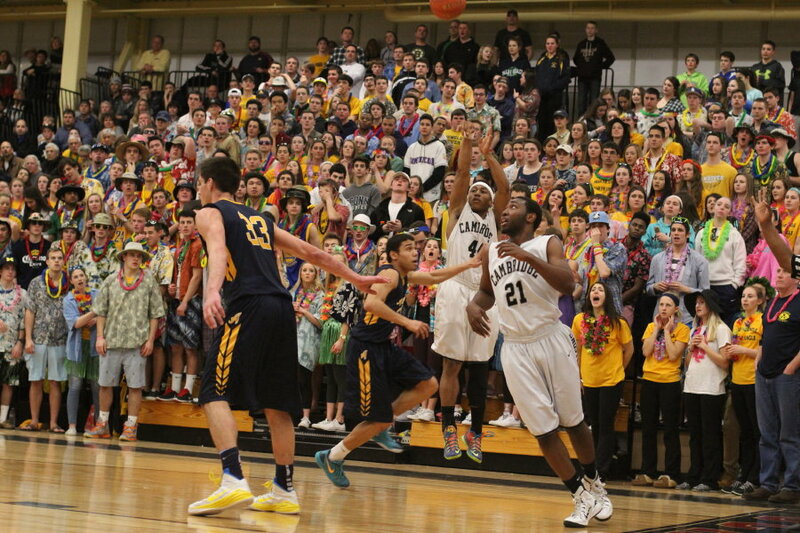 The crowds for both schools fit nicely into the Sixth Man category. 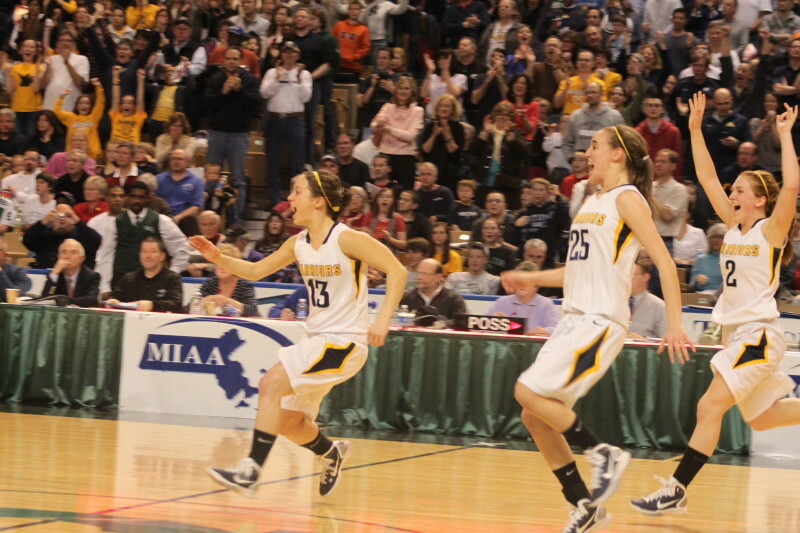 The Lancers seemed to ride the crowd wave down the stretch as they got closer and closer. 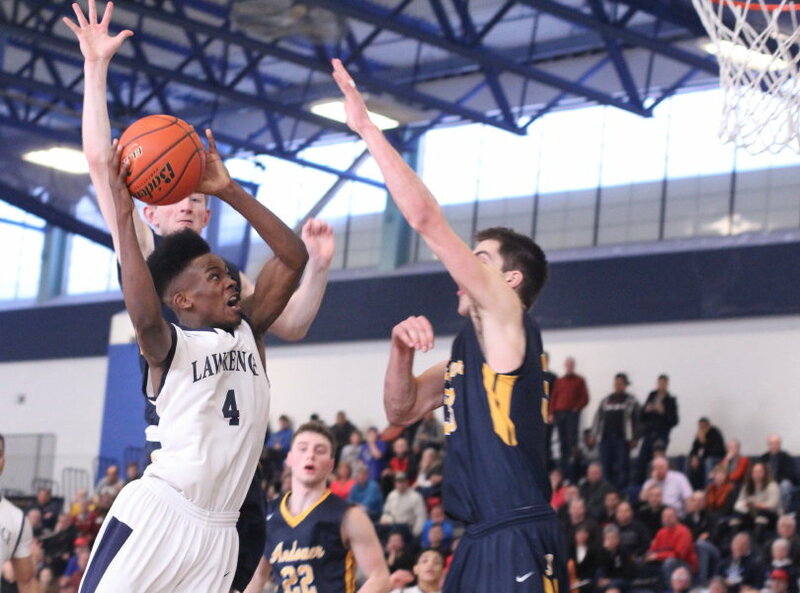 When Lawrence took the lead late in regulation you sensed that the Lancers might get the job done but two free throws and Connor Merinder’s basket offset a jumper by Dantae Neal (19 points) and overtime happened. 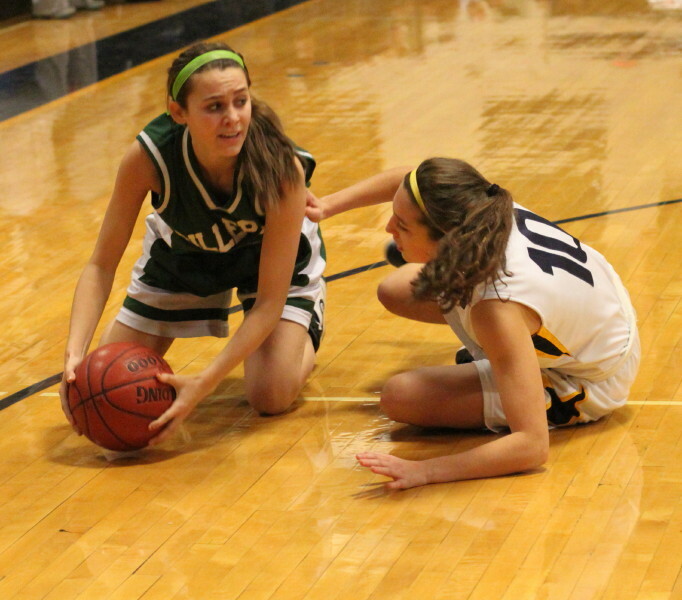 The end of the first overtime was about as exciting as it gets. 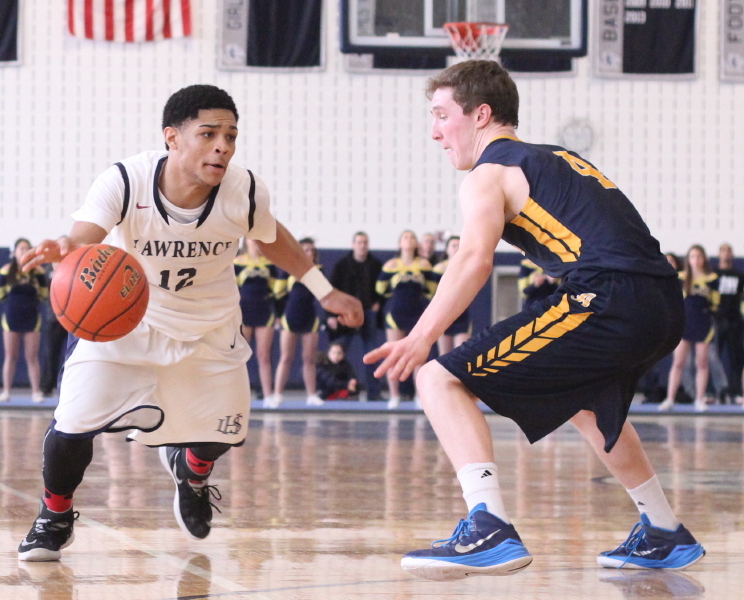 Andover was up by two with the ball and close to a minute left but EJ Perry got caught going behind his back and Lawrence had a steal for two to tie the game with thirty seconds left. 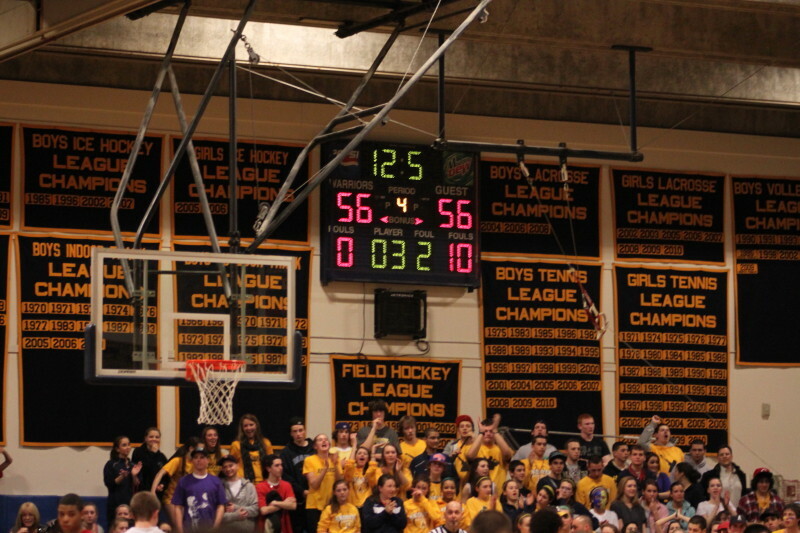 Andover chewed up a lot of clock before Jonathan Rodriguez drained a three with twelve seconds left. 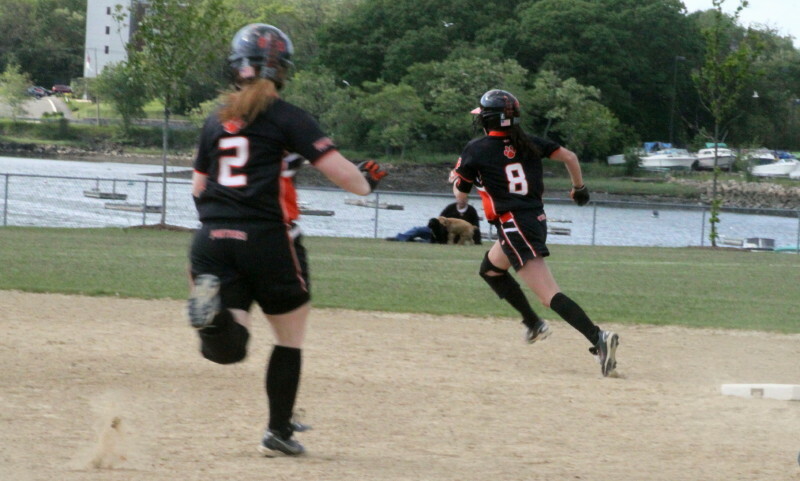 Game-winner? Not yet. 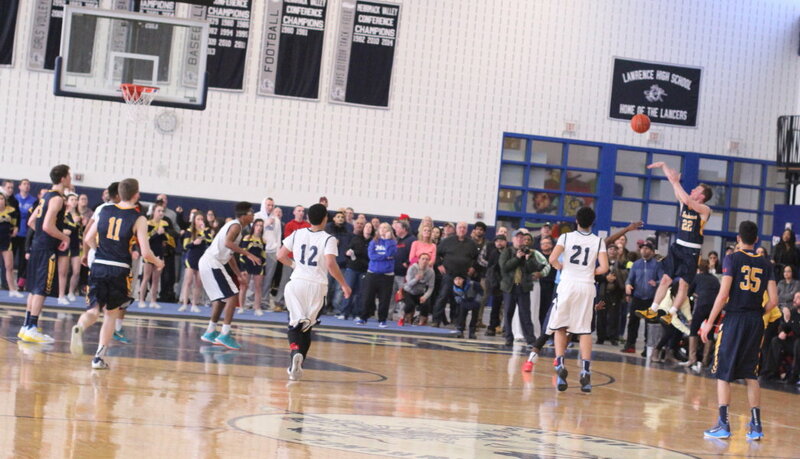 Julio Vicente found daylight down the other end and sent the game into a second OT with a three of his own. 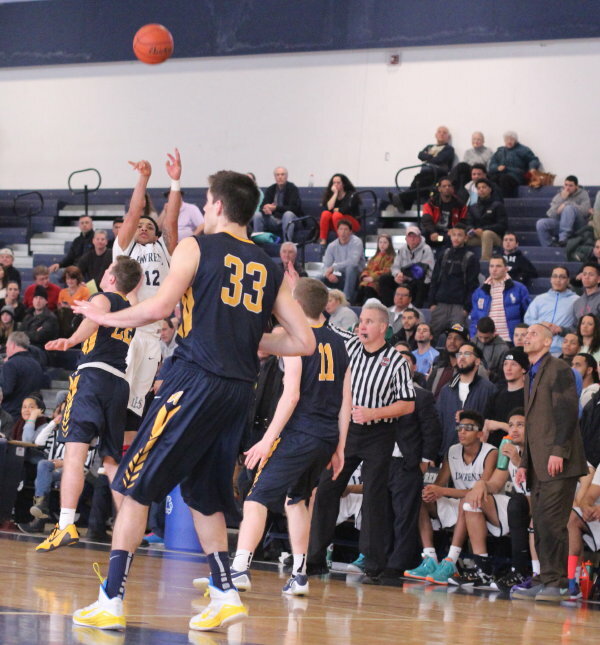 Jonathan Rodriguez (13 points) would also notch a 3-pointer and four free throws in the second overtime. 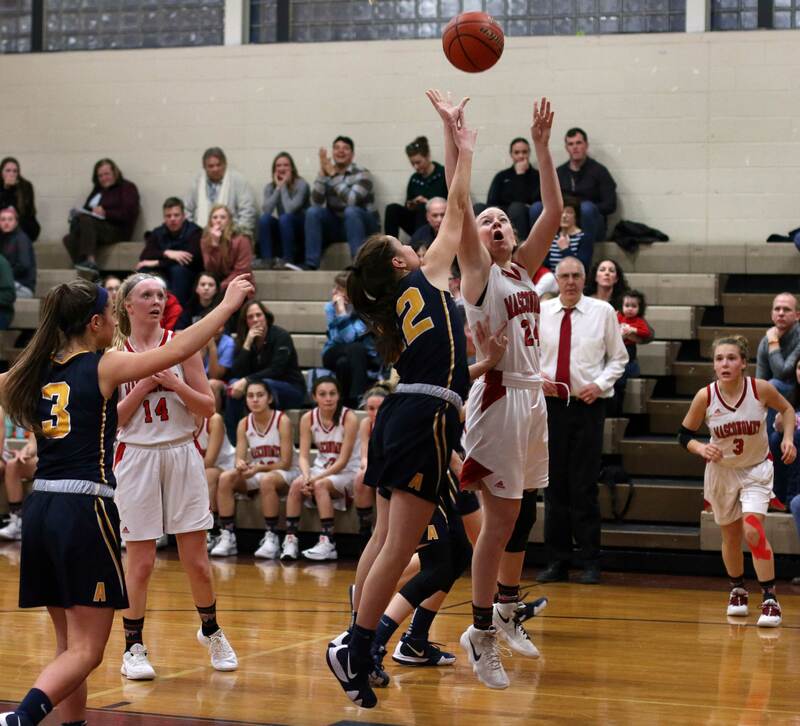 Andover moves on to face top-seed Cambridge Ringe and Latin (19-2) on Wednesday night at North Andover at 7PM. 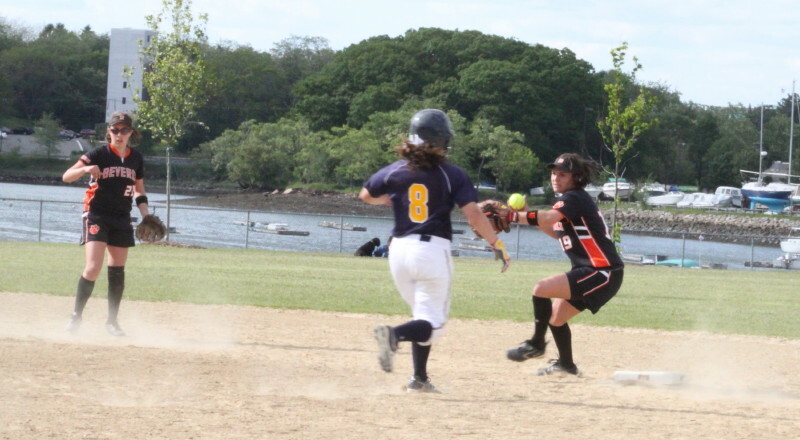 Andover and Lawrence are from the Merrimack Valley Conference. They split their two regular-season games. 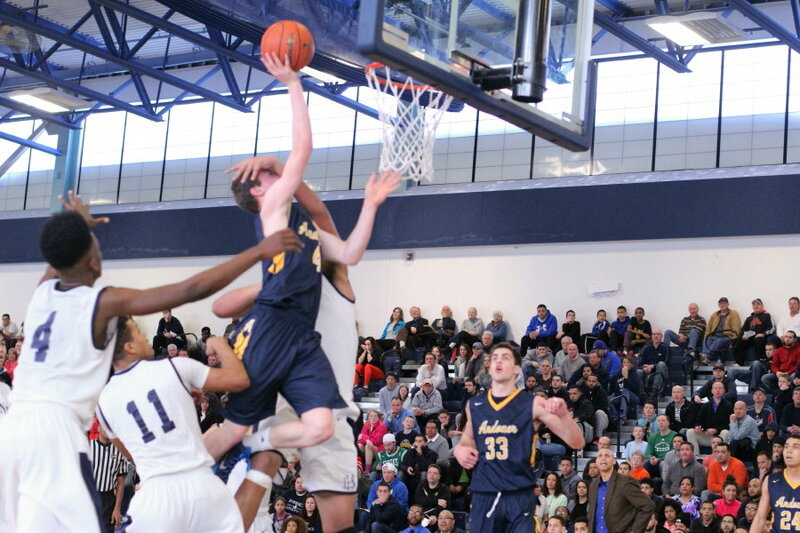 Joe Bramanti (22 points) applies some defense to Jaycob Morales. 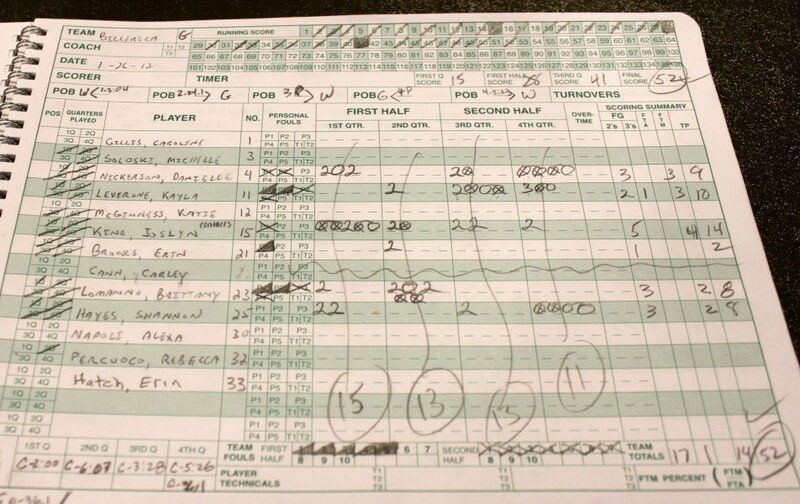 Jaycob Morales (10 points) hit the last-second, 3-pointer to give Central Catholic the win. 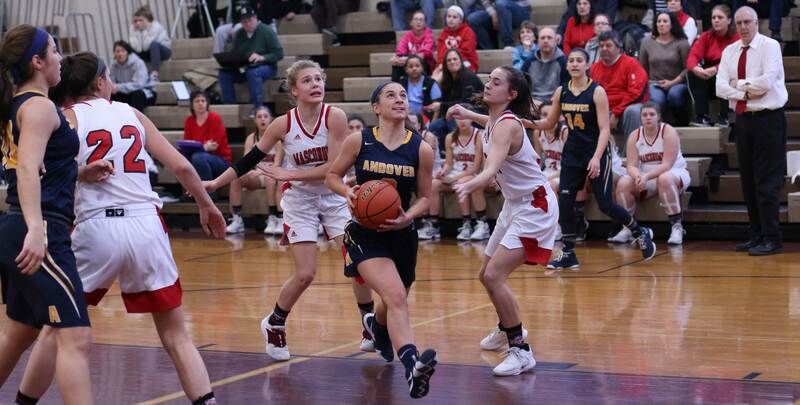 (Andover) Jaycob Morales hit a three in the 3rd quarter to put an end to an 18-point Andover run and topped that shot with a game-winner in the 4th at the buzzer to give Central Catholic (17-1) a 59-56 victory on Thursday night at Andover High School. Jaycob’s three climaxed a game that both teams seemed to have taken control of a couple of times. 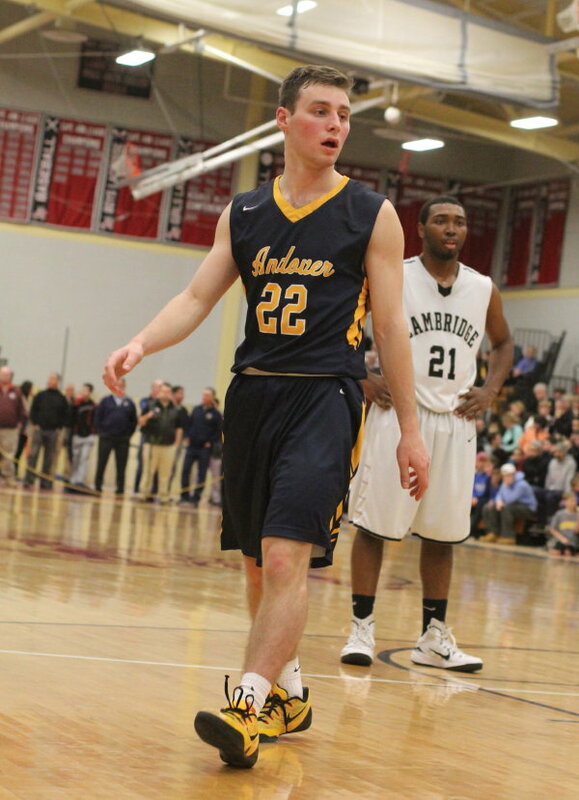 Andover’s Craig Luschenat (13 points) tied the game (56-56) with a three from the right corner with 56 seconds left. 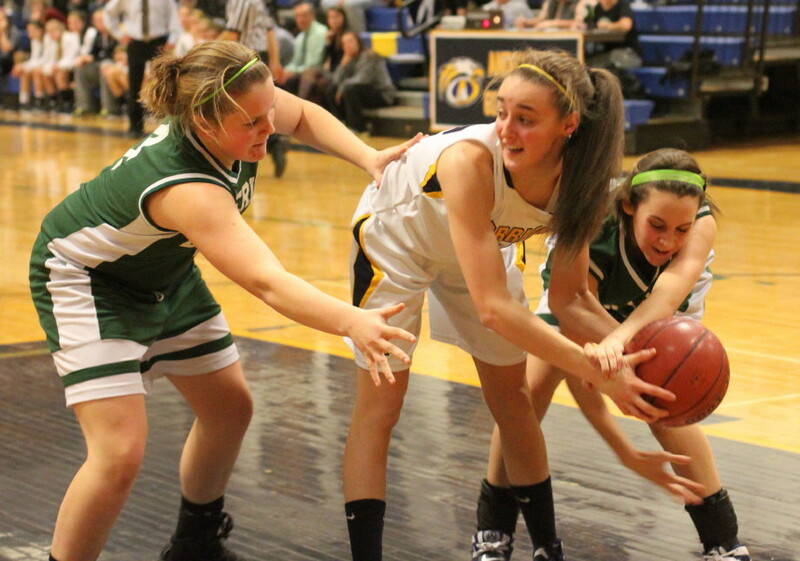 The teams then swapped missed shots setting the stage for the Raiders with 12.5 seconds to go. 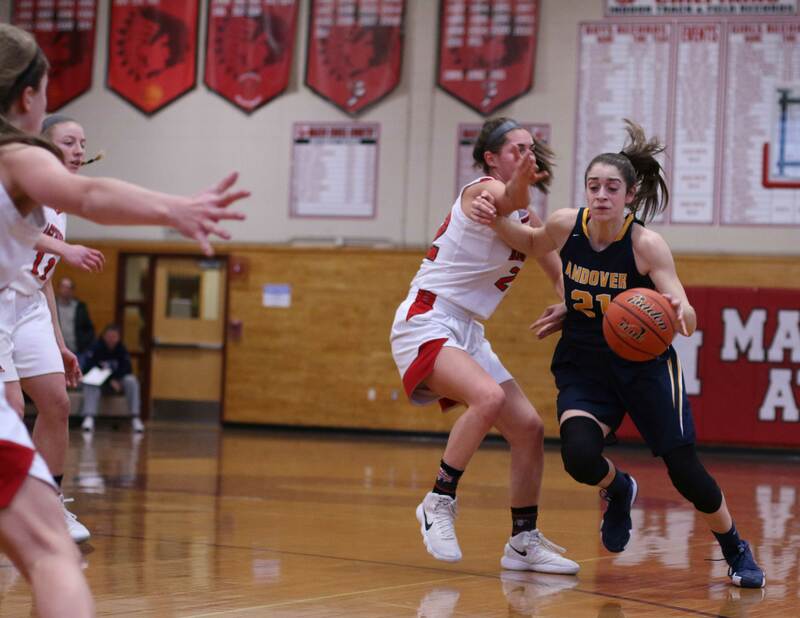 You suspected that CC coach Rick Nault might set Jimmy Zenevitch (26 points) up in close for at least some foul shots or maybe have a drive to the basket from Luis Puello (13 points) or Jaycob Morales (10 points). 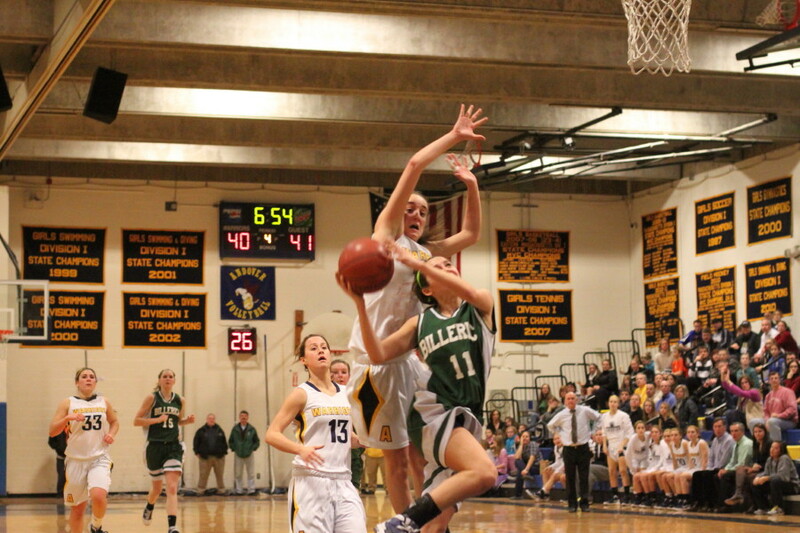 You knew that whatever CC did, it would be done late so that Andover couldn’t respond if there was a miss. The “late part” went as expected. 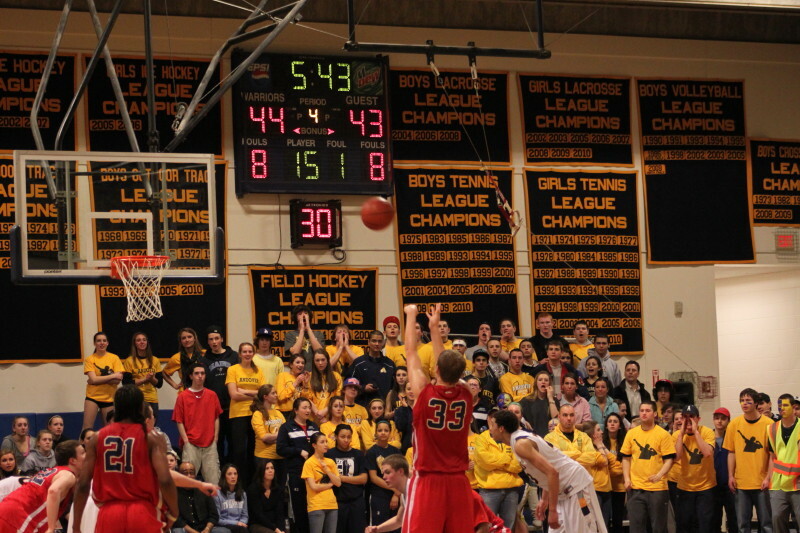 The Raiders, however, stayed outside and when Jaycob’s final shot, from just to the left of the top of the circle, went through the net there wasn’t even time for Andover to get the ball inbounds. 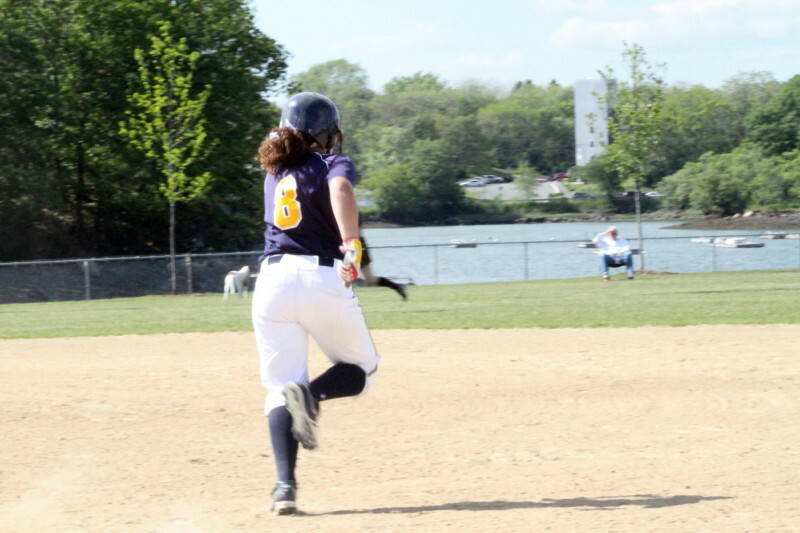 Despite the fact that Central Catholic had already clinched the Merrimack Valley title the tone in this one was at the post-season, tournament-final level. 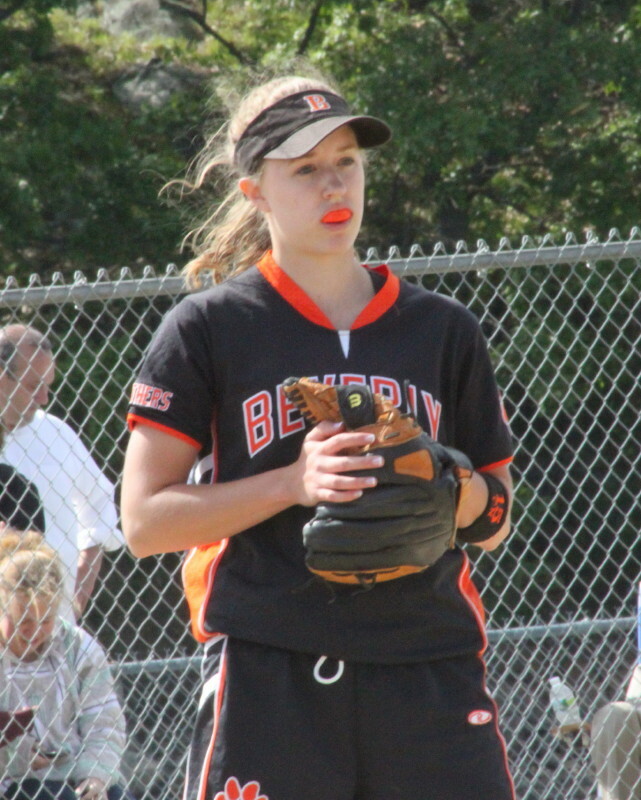 There was plenty of vocal support from the two team’s student sections and plenty of crowd-pleasing action to watch. 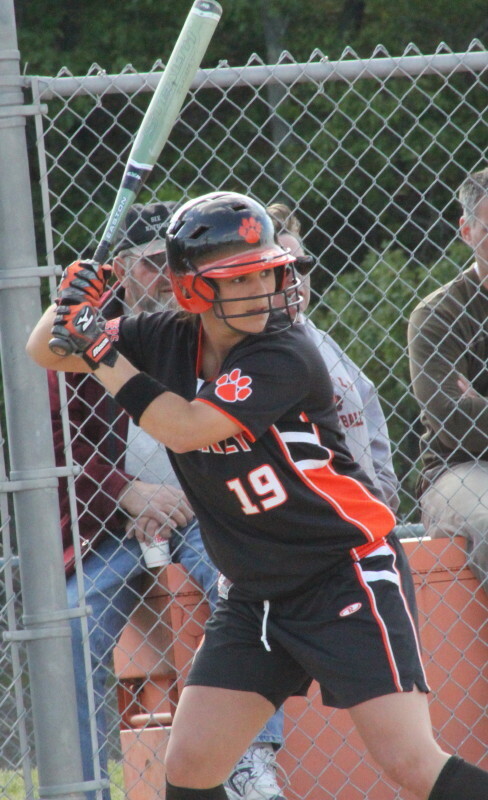 The teams had split the two previous meetings. 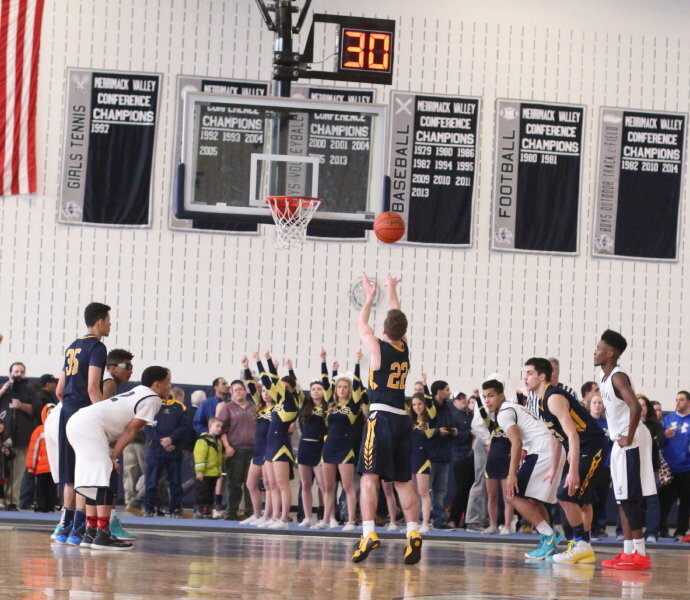 Jimmy Zenevitch (26 points) puts up a free throw in the 4th quarter that tied the score. 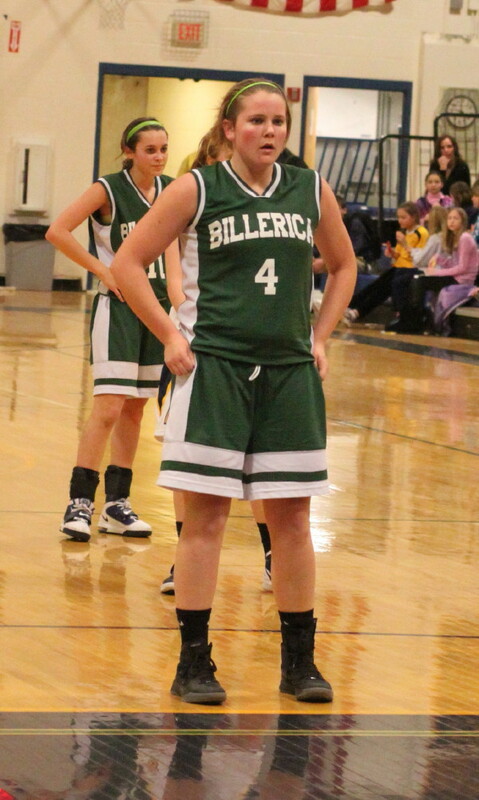 CC was by far the better team in the first half. Despite an unseemly twelve turnovers, they frequently got the ball into 6-7 Jimmy Zenevitch’s hands for high percentage shots. They shot nearly 50% in the first half. 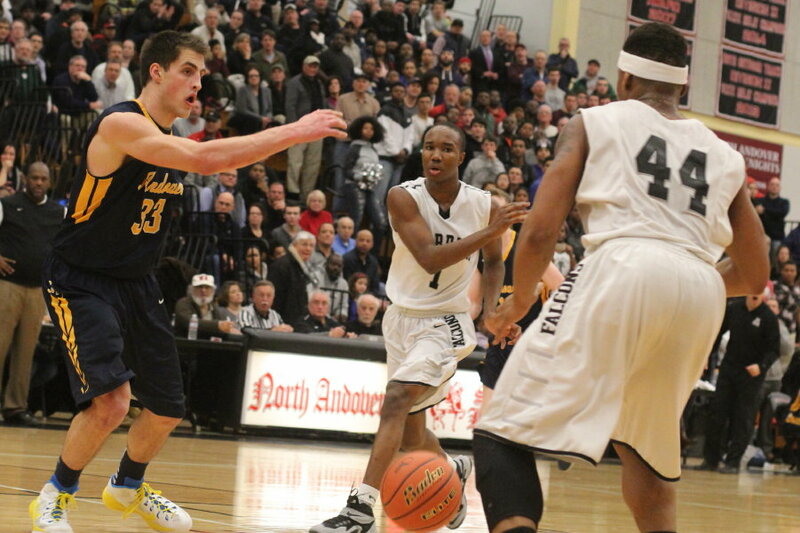 Andover had Joe Bramanti (“The Brama Bull”) bring the ball into the frontcourt on almost every possession. He delivered twelve points but there never was an easy attempt. Having Luis Puello chasing him everywhere he went factored into his struggles early on. 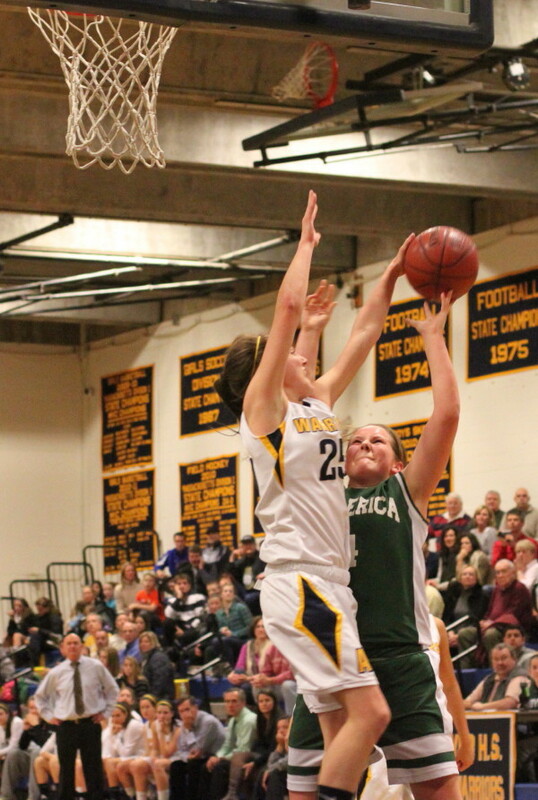 Andover trailed 27-20 at halftime. 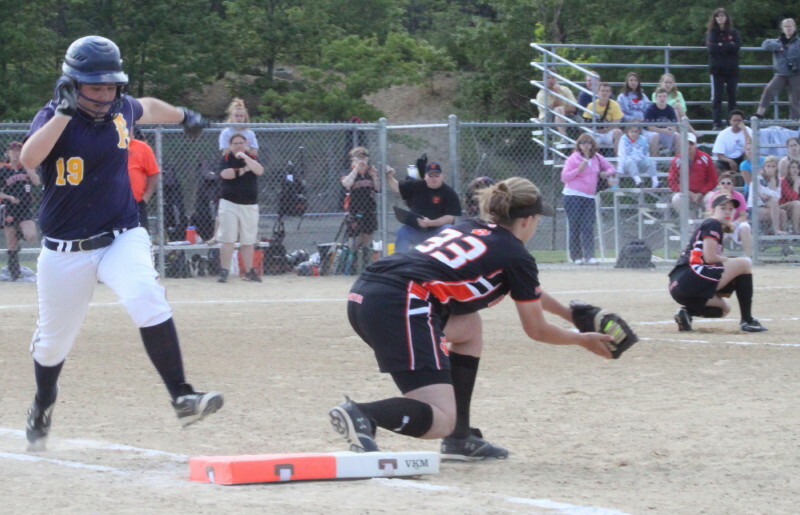 It was obvious that Andover had zero chance of winning if the second half was a repeat of the first. I don’t know what was said at halftime but the Golden Warrior team played a third quarter that was remarkable under any conditions. 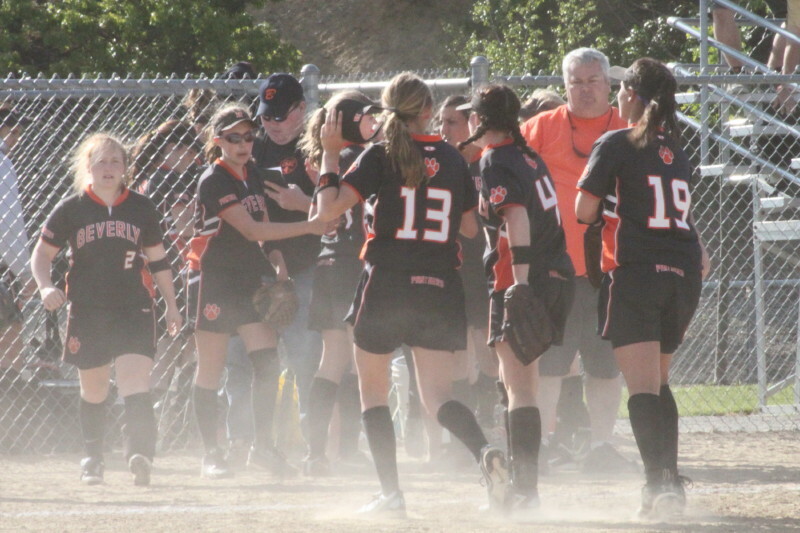 Played against the #2 Division 1 team in the state and it was indeed something special. 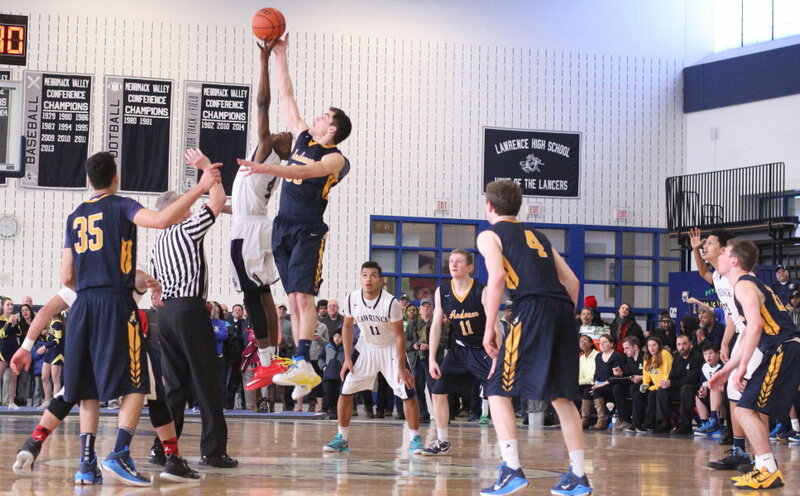 Luis Puello (13 points) defends Joe Bramanti. 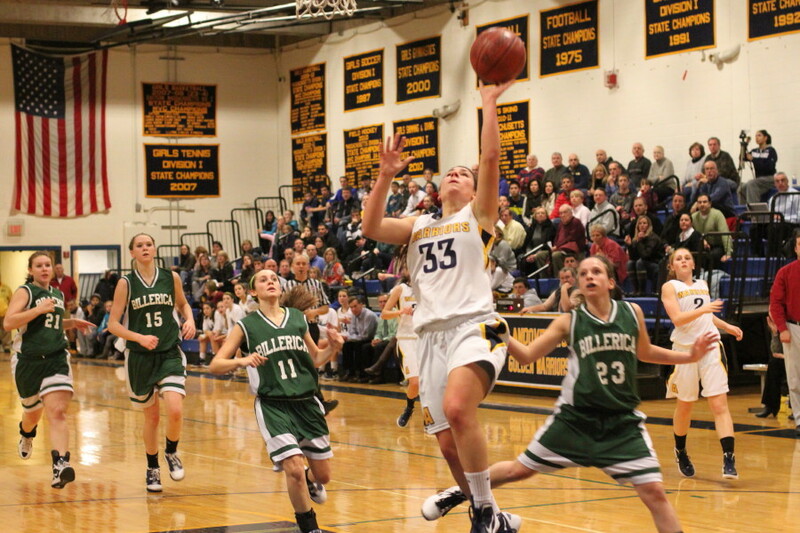 Andover went from trailing 27-20 to leading 38-27 in about 6 ½ minutes. That’s a nifty eighteen unanswered points! You never saw such a turnaround. The Raiders missed two free throws, eight shots from the floor, and committed seven turnovers during this ugly (for them) segment. Joe Bramanti (8), Brian Salvesen (4), Craig Luschenat (4), and Jack Kieckhafer(2) all contributed points for the Golden Warriors. 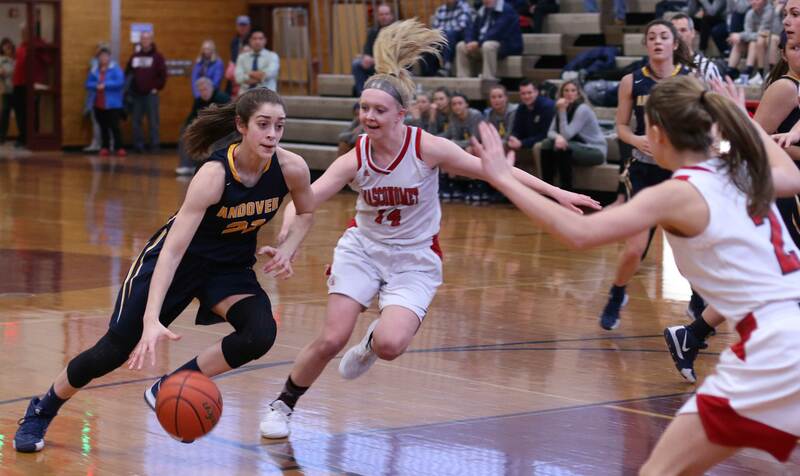 You watched the onslaught and had to start thinking that Andover, with a 42-31 lead after three quarters, was on their way to a W. It didn’t turn out that way. The 4th quarter started and instantly it’s CC that can’t miss and Andover begins to struggle to score. 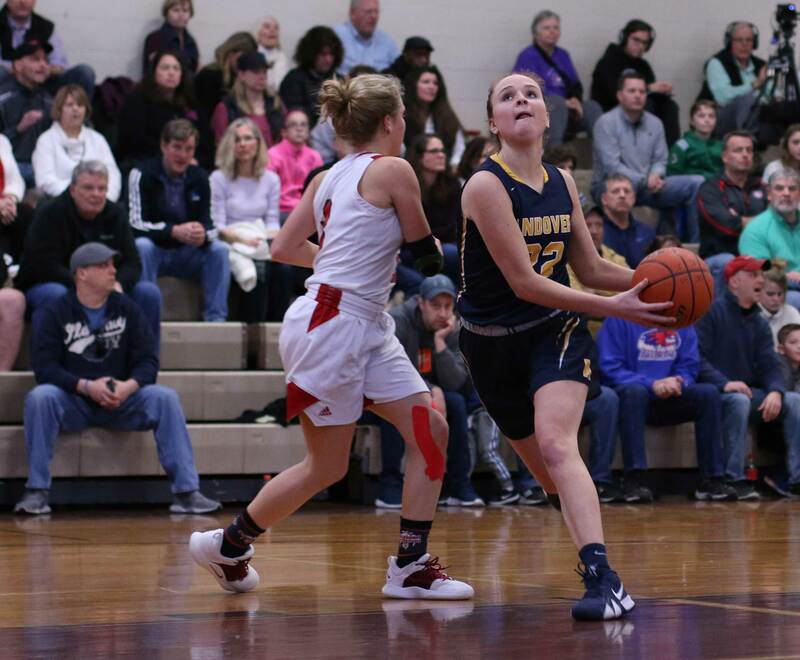 In three minutes and fifteen seconds the Golden Warriors squandered their entire eleven-point lead thanks to a 17-3 run by the Raiders. 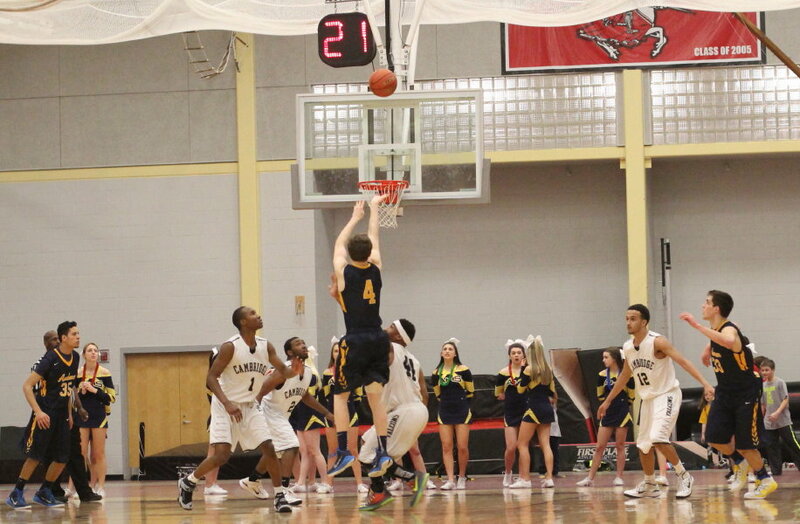 Jimmy Zenevitch came alive with two layups and two old-fashioned 3-point plays. 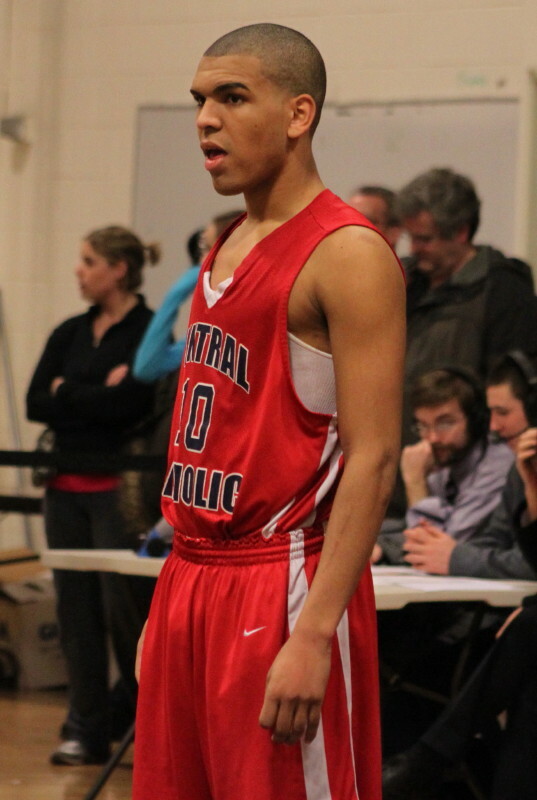 Jaycob Morales hit his second of three 3’s in this comeback segment for Central Catholic. 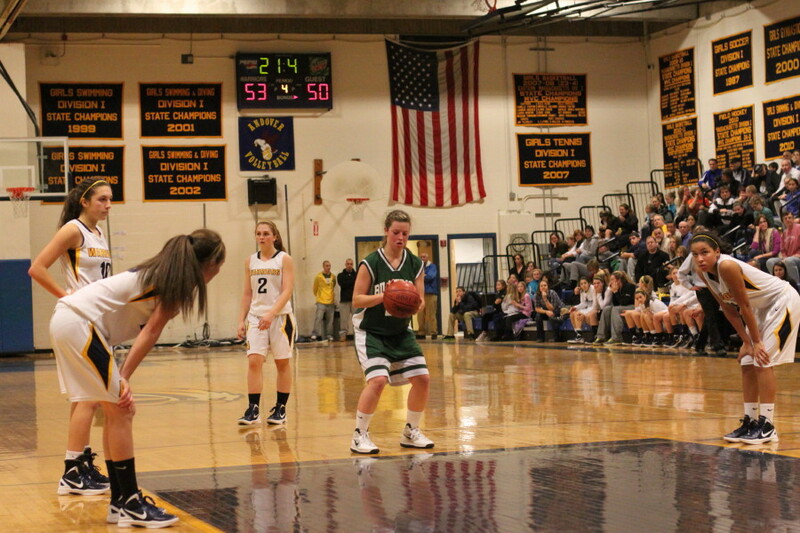 With 4:44 to go and a 48-44 lead it looked as if CC was ready to roll to victory but credit Andover for fighting back. 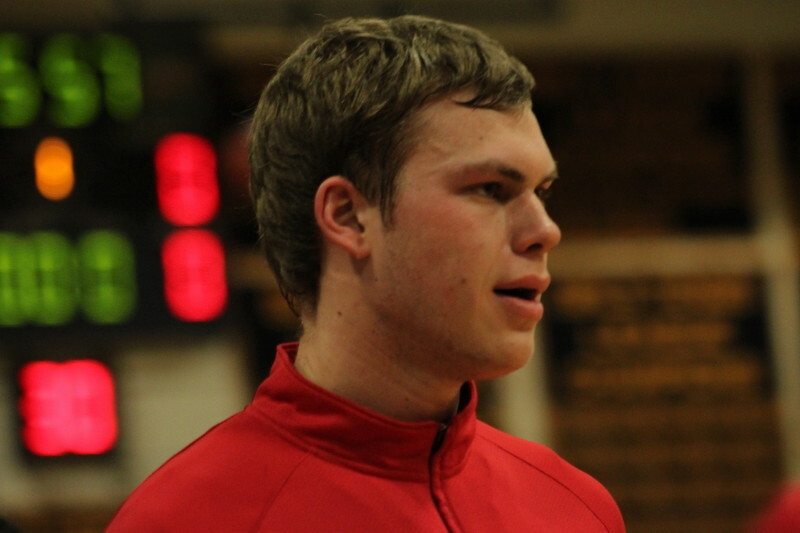 Despite missing three free throws, the team rode slashes to the basket by James Costello and Jack Kieckhafer, and the last-minute three by Craig Luschenat, to a tie score before Jaycob Morales’ last-second heroics. 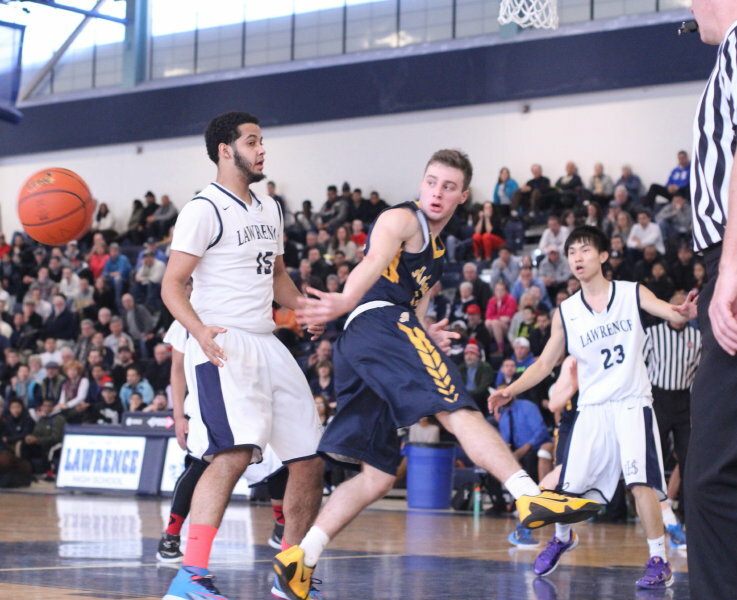 Luis Puello scored thirteen points but it was his defense that was noticeable. 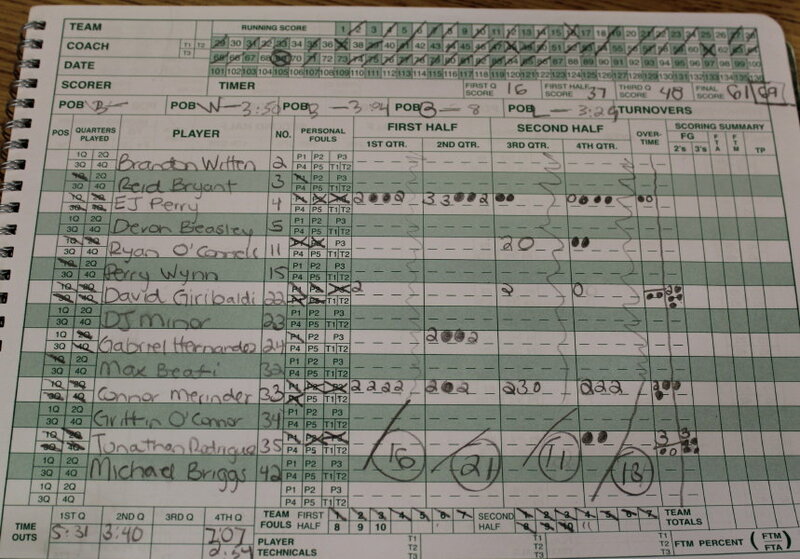 He made Joe Bramanti work hard for his 22 points. Luis picked up his 4th foul with five minutes left but managed not to foul out and also to continue to play great defense. 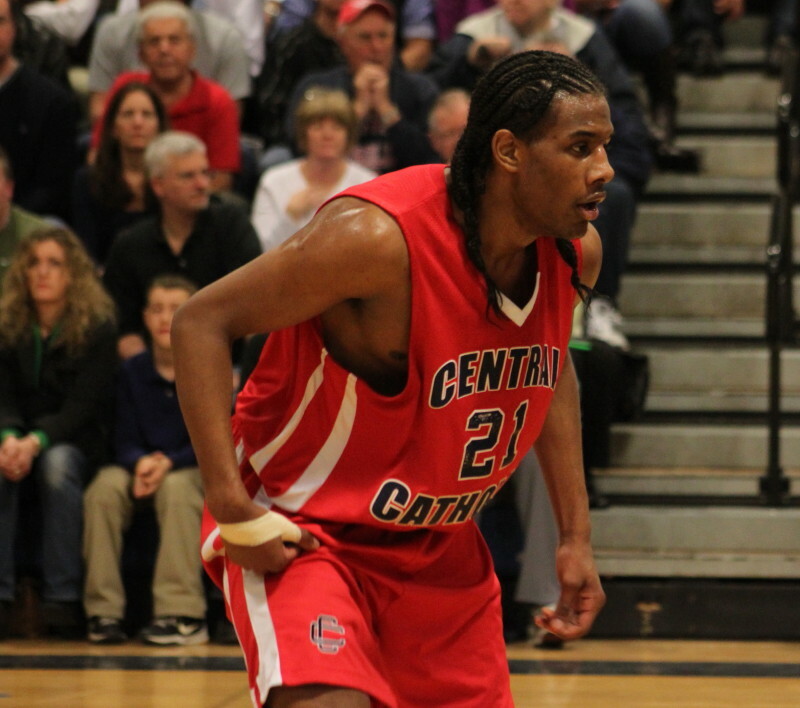 Joel Berroa scored only four points for CC but he set up Jimmy Zenevitch for a number of layups with his passes. 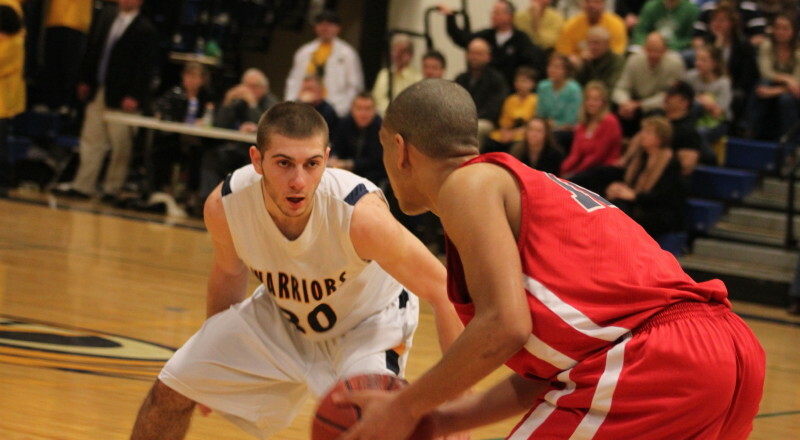 Joe Bramanti struggled with his outside shooting and had to face shot-blockers when he drove. Still he managed 22 points. His defense was impressive to watch against Luis Puello and also Jaycob Morales. Coaches from St.John’s Prep and Lynn English were in the house. 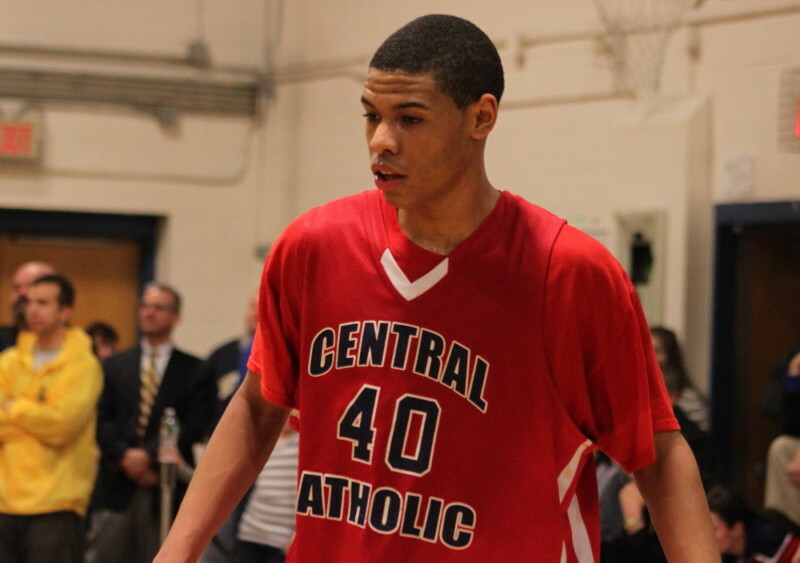 Central Catholic plays at St. John’s on February 23rd. 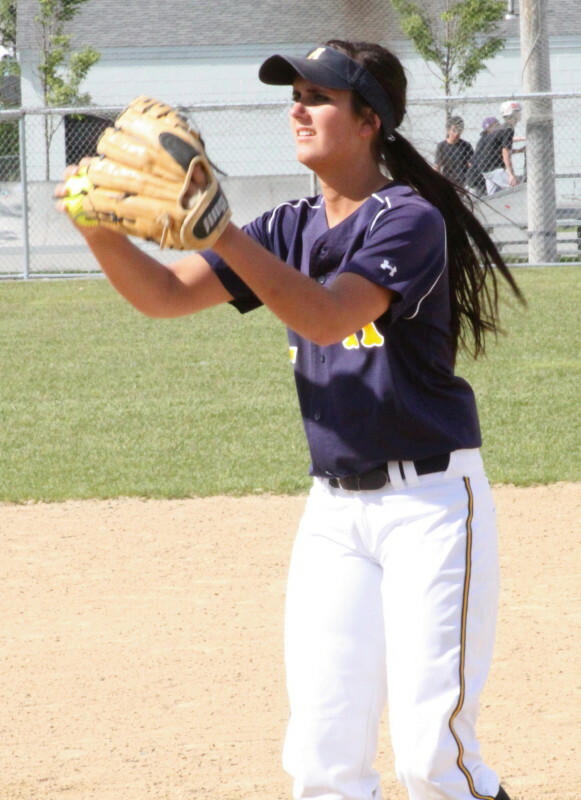 Lynn English is in a tournament at Central Catholic starting Sunday and could face CC in the finals. Seniors were honored before the game. The Raiders have now won thirteen straight. 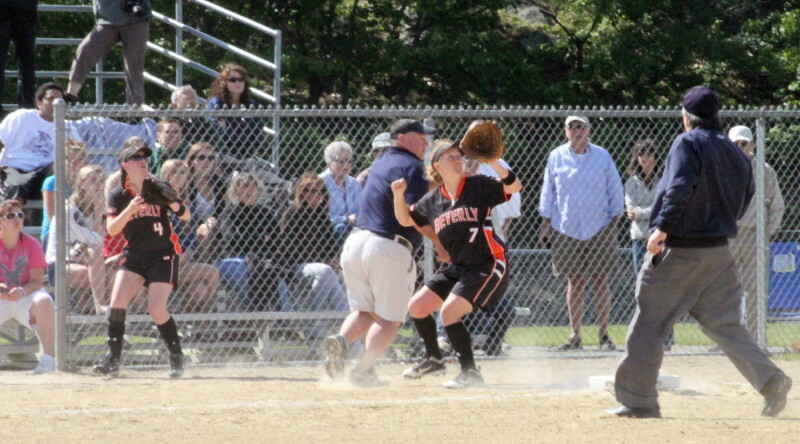 Andover (13-4) defeated North Andover earlier this week. 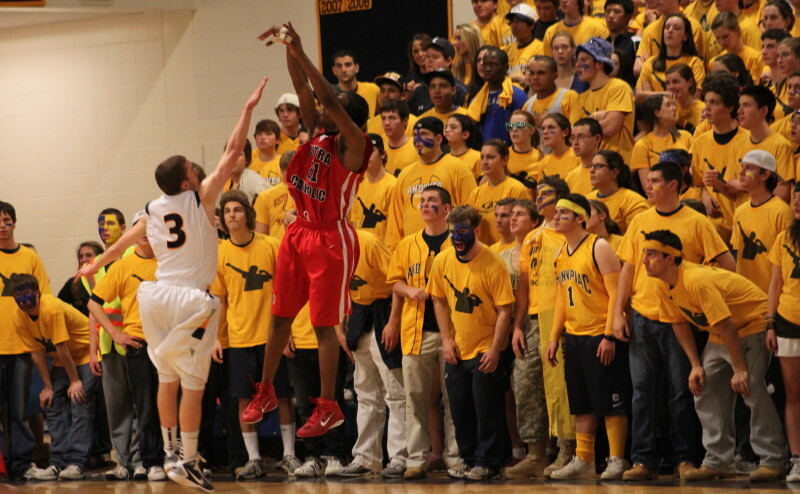 Luis Puello shoots over Jack Kieckhafer in front of the Golden Warrior student section. The student sections created so much noise that you never heard individual voices. The cheerleaders from both teams performed stunts that looked dangerous to this reporter.